Family is everything! 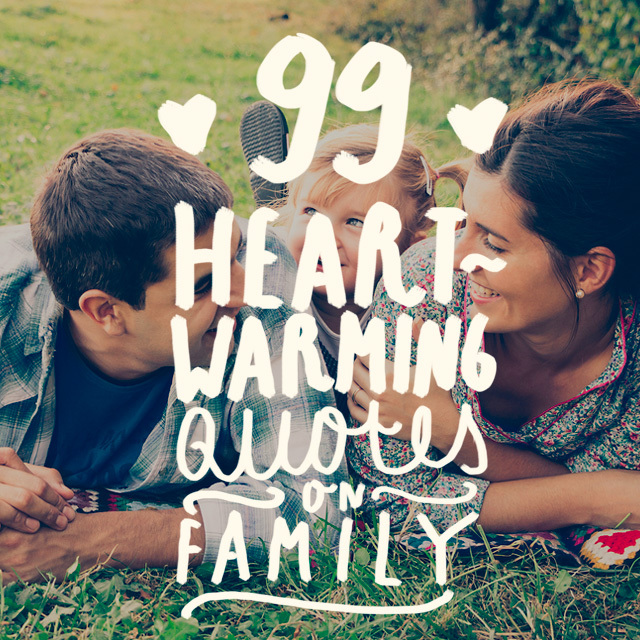 Feel those good vibes for your family members by browsing through our list of quotes on family and remember to appreciate them every day. Some family is not of blood but when the heart loves fiercely, that is what makes family. It does not matter if you are related to someone by blood and DNA, the heart with which we love and are loved, as well as the depth of sincerity of it, is what is really important. 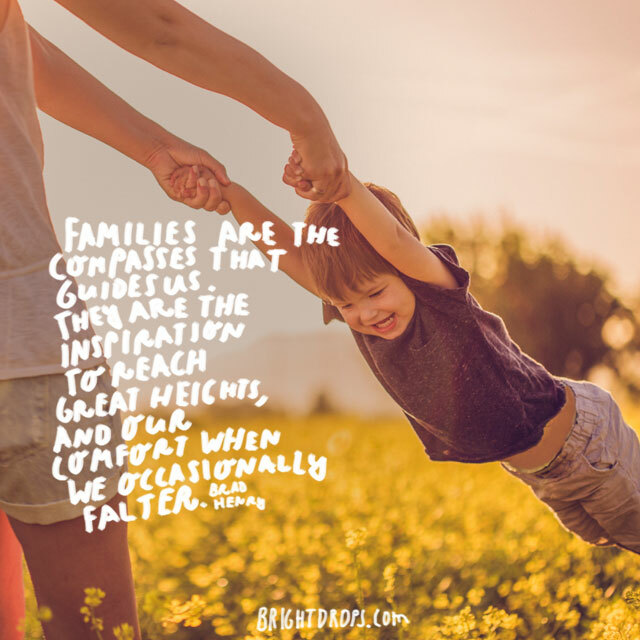 It might be easy to take your family for granted during the good times when things are easy, but a true family will offer the comfort of hugs and the support of just being there when you need them. 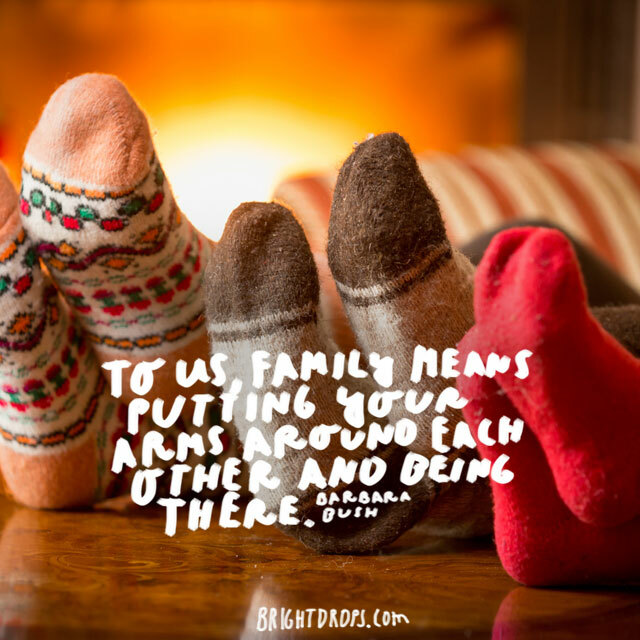 Even if you can do nothing else, hugging and being present for your family is important. 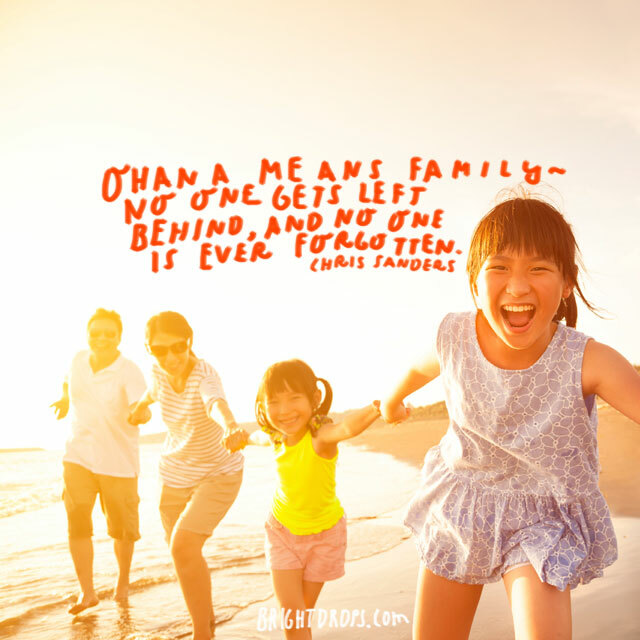 You might recognize this family quote from the animated movie, Lilo & Stitch. Though it is a children’s film, the message is a strong one of family. You and yours need to stick together and make sure that no one gets left behind or taken for granted. Your family might drive you crazy at times, and you might feel that you can never get away from them. They are as much a part of you as you are of them. Even if drive you crazy from time to time, deep down you know that you’d be lonely if you ever did escape them. 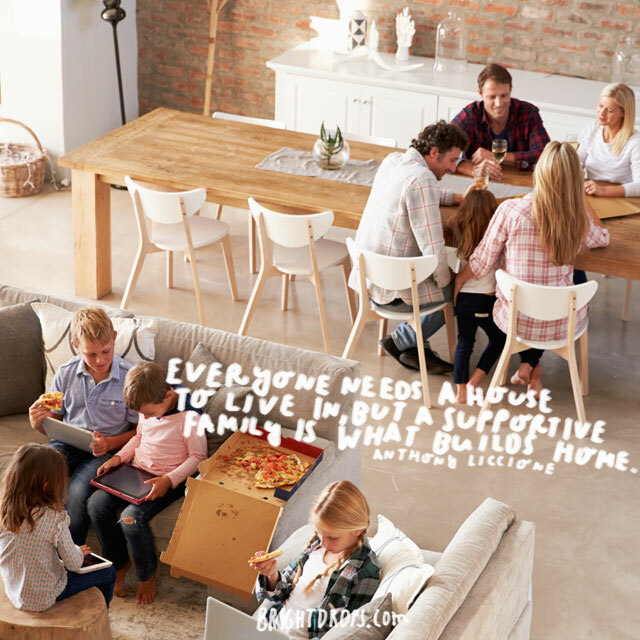 You can live in any house, but a loving and supportive family is what creates a home. Without laughter, joy, or companionship, a house is but an empty shell. Giving and receiving support from those we love can build the solid foundation of family values. 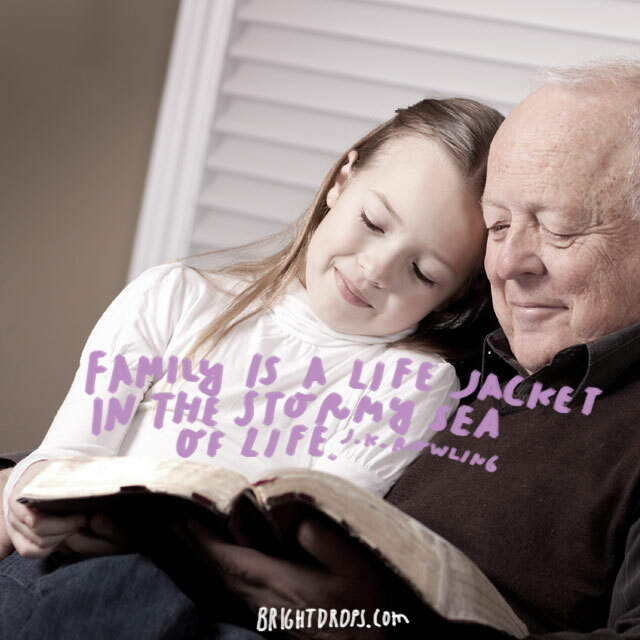 Families can be strong units of love, devotion, friendship and support. No matter if you have family that shares blood, or a family you have chosen for yourself, do what you can to take care of them; they are the only family you’ve got. 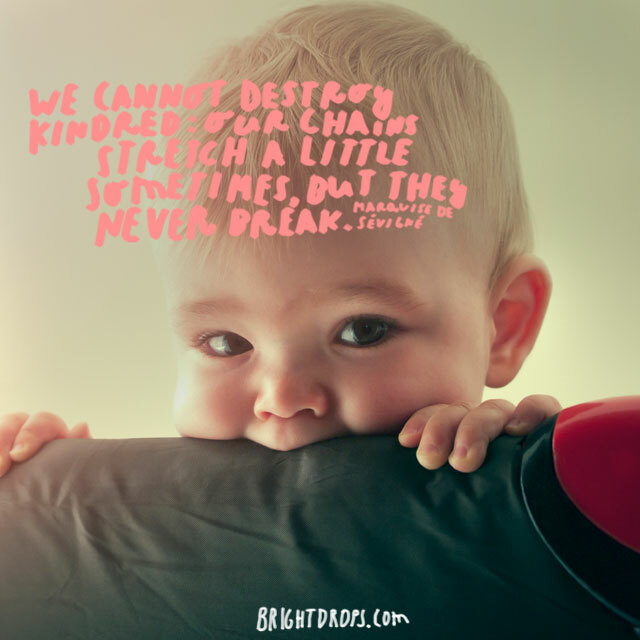 Loving your children comes as instinct at first but then it grows into more as you get to know the little people that you helped bring to life. The experiences and memories that are created while raising children can lead to a strong bond between parent and child. The love of family comes more easily than love from strangers. Do your best to not take for granted the love that not only your parents have for you, but other family members as well. 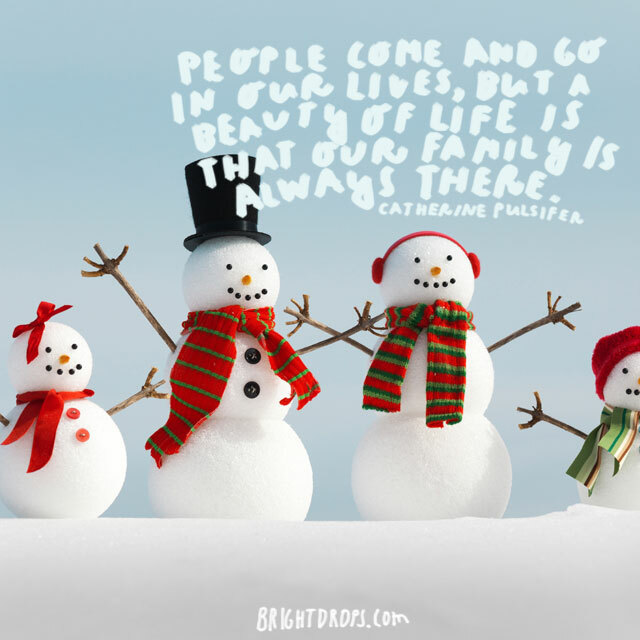 Where the world might be cold, the love of family is warm. It is possible to love someone even if you don’t spend much time together, though time spent one on one with family is enriching beyond belief. 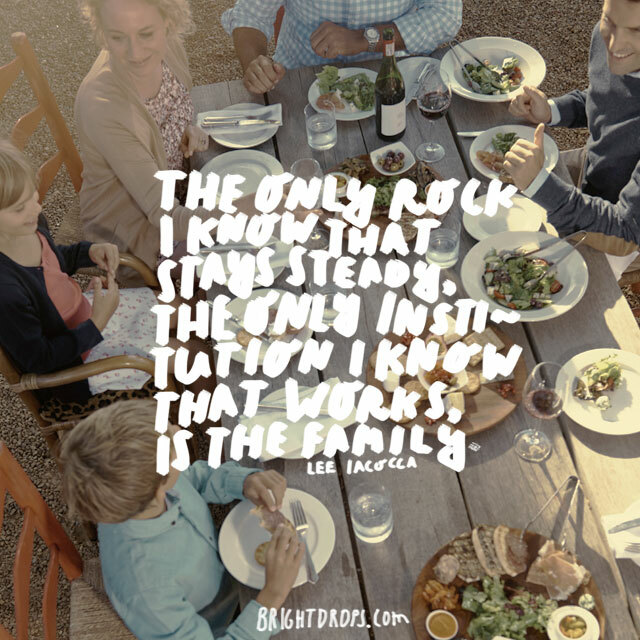 Make sure to spend time with your family in whatever ways you can. To give of your time is a valuable gift indeed. It might not seem so, but family really is everything. They are the ones that help you out when you need it, be there when you call, the ones that tell your friends embarrassing stories about you and love you no matter what. Make sure to do the same for them. 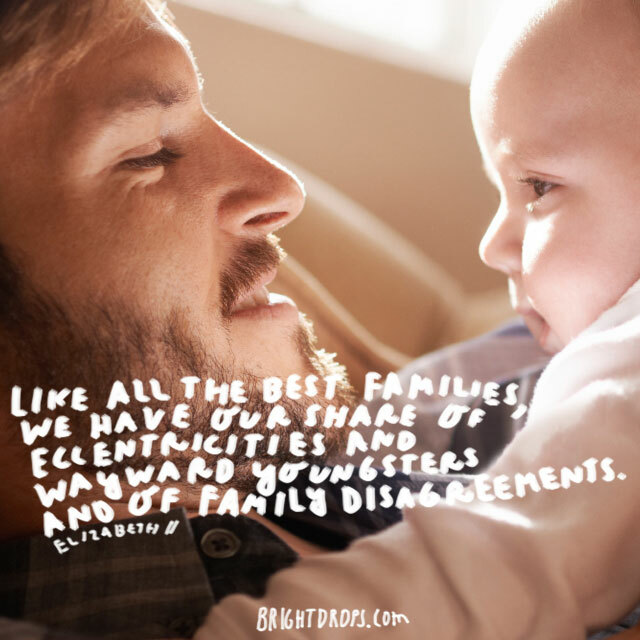 This quote about family rings quite true, doesn’t it? If you find that you go about your days by taking your family for granted, you may want to reconsider and reach out to your loved ones as much as you can. 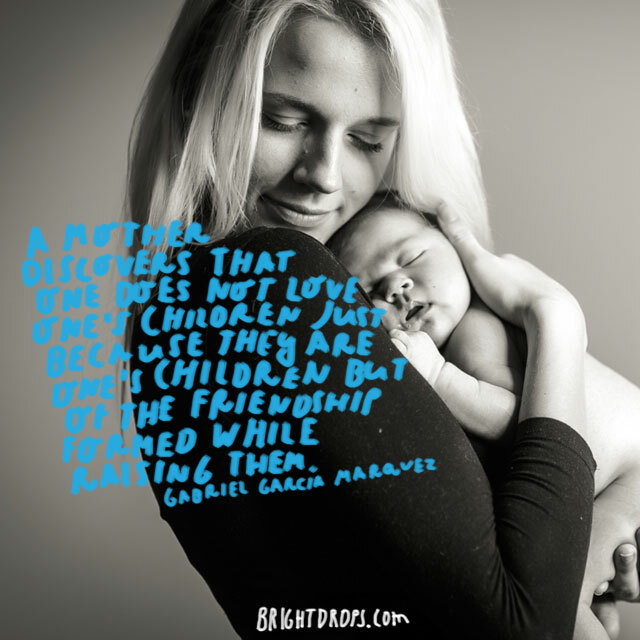 Make time for them; show them you love them. 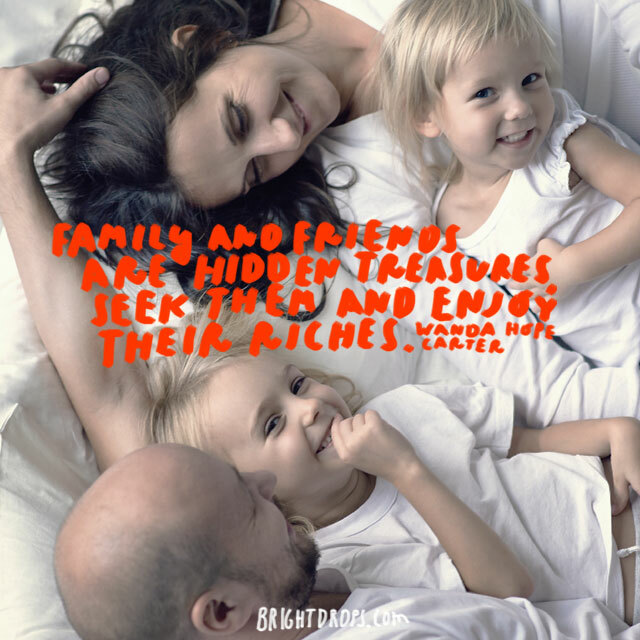 There are so many treasures within those we love! Your friends and family help push your limits, stretch your thinking, love you through thick and thin and they can be the greatest teachers in this life. Their gifts, talents, and abilities can enrich your life tremendously. 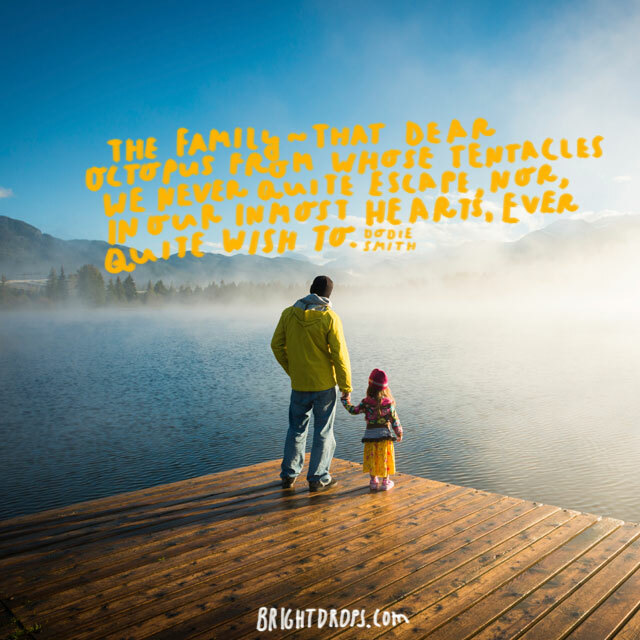 When you take your family for granted, the relationships can grow stale. 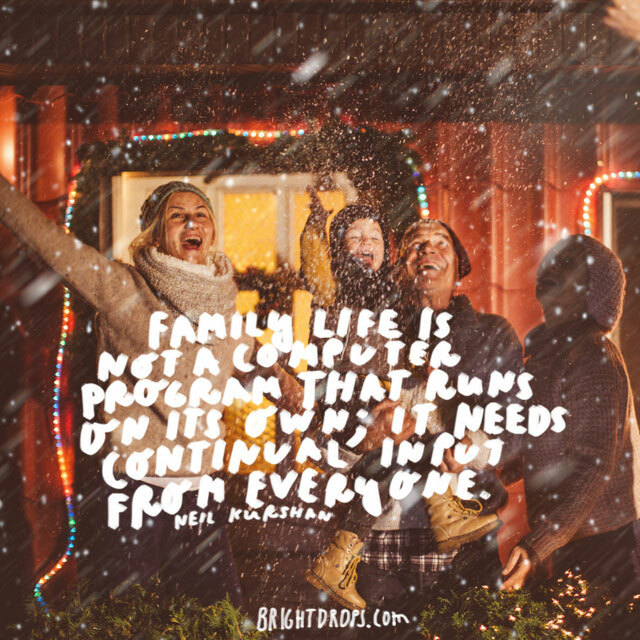 Invest the time and energy needed to keep your connections with your family strong and full of love. Visits, calls, emails, and interaction on social media can ensure you keep cultivating your familial relationships. As babies, we are in a family from the very beginning. 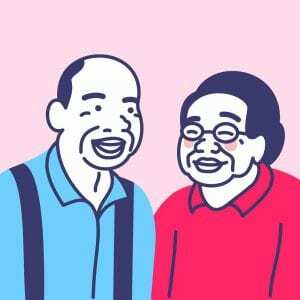 As a person on their deathbed, family will usually gather to be of what support they can. 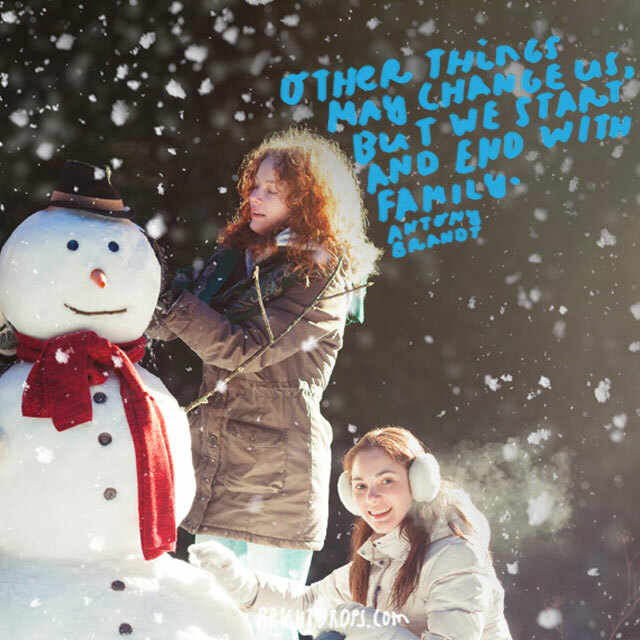 Family should be there from beginning to end at the most important transitions of your life. 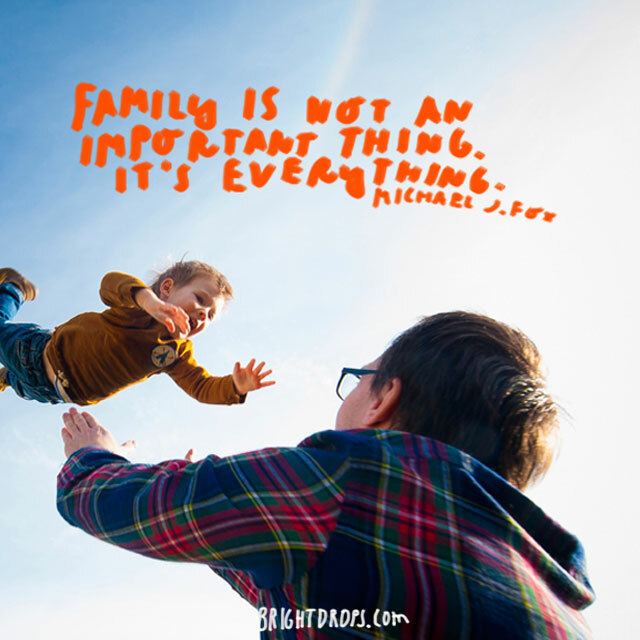 Make your family an important priority in your life. The DNA you carry in your body contains echoes and memories of your family members from the past. As a bridge to the future, our family exists as our children, the support given during hard times and through learning about our ancestry to better understand ourselves. This quote fits right in with family. 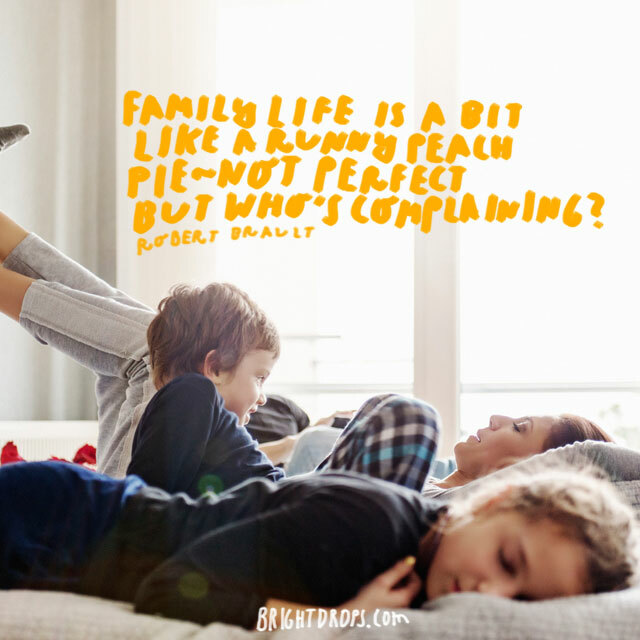 Are you taking your family for granted, or are you taking them with gratitude? 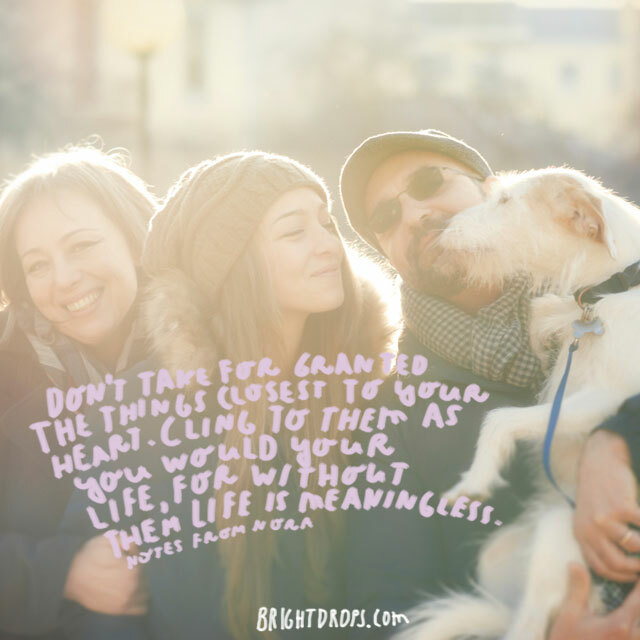 Practice gratitude for the love of your family, but also find gratitude for those tough relationships that might exist that teach you important lessons as well. Even if you are not very close to your family, those chains of kindred connections are always there. We cannot change our birth stories or sever the blood lines, it’s true. 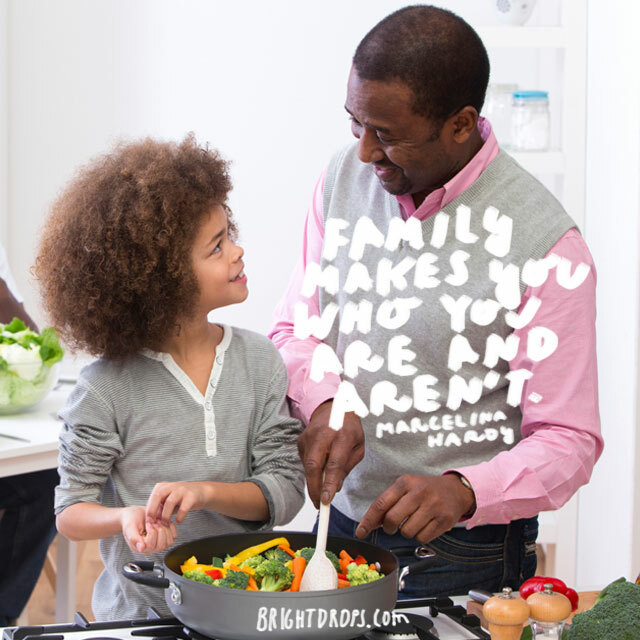 However you can learn your best from the family you have and create your own family in your own ways. This might seem an odd thought at first, but how true it is that in families we are all similar and held together by familial bonds, but we are all independent as well. You might be separated from your family but the blood you share holds you together. The family we cherish needs to be protected and valued. We might cherish and value material items but without people to love and support us, life is truly meaningless. Don’t take those you love for granted. Call them today and tell them you love them, and hug them when you see them next. You don’t need to share blood with the family you have. Family is a shared experience of respect, love, and loyalty. 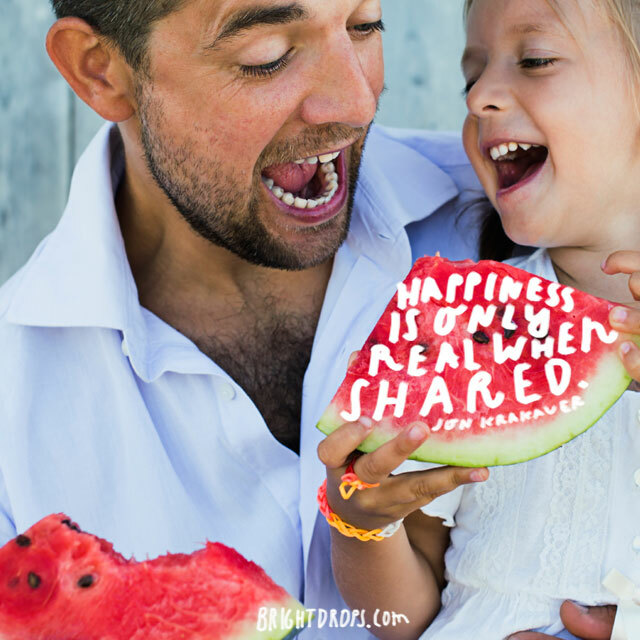 Share these things with those you love. 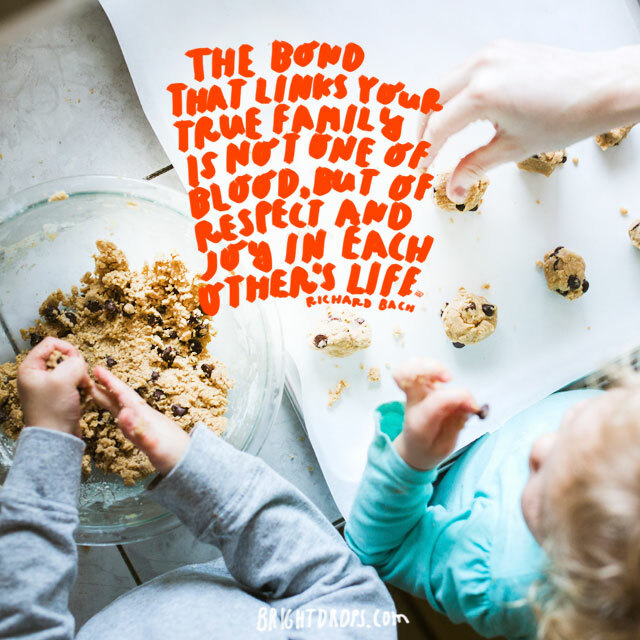 When you truly care for someone in your life, the bonds of family wrap tightly around you both. 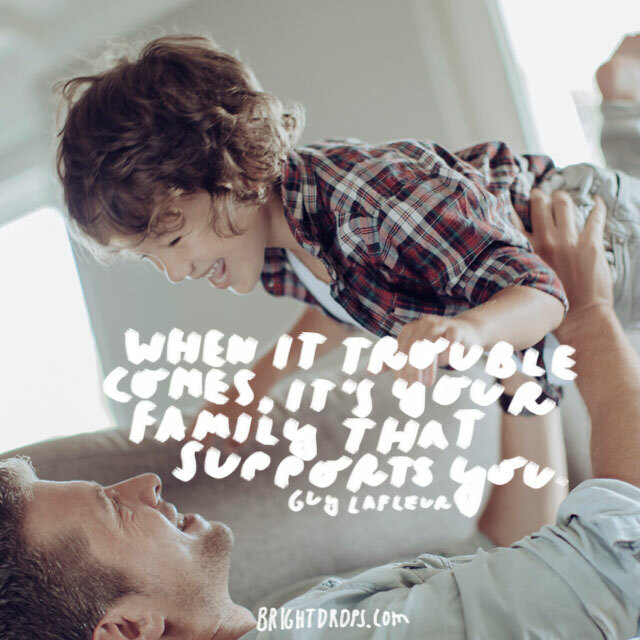 Your family can be that which keeps you afloat during hard times, as well as being a source of tremendous support for you. Family might be considered weakness because to love makes us vulnerable to pain, but they can also be your weakness because they are probably the ones to push your buttons and get you to react! 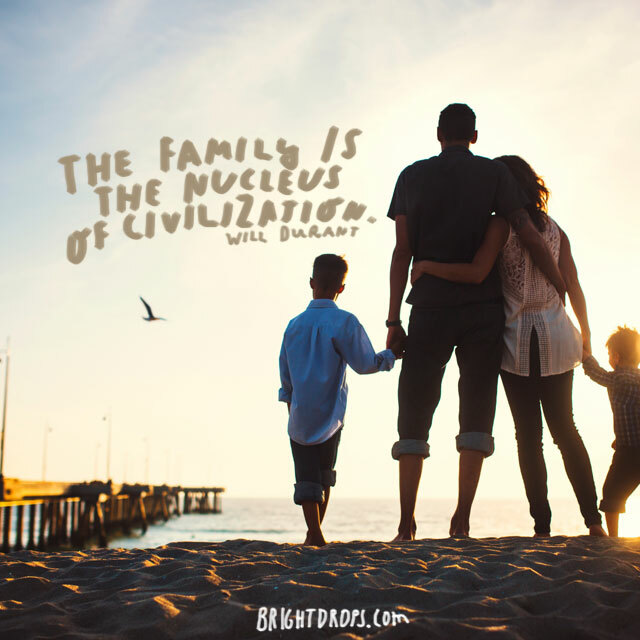 Families have been a part of every civilization since the dawn of time. People join families in marriage, have babies and come together to survive. In ancient times it was very important to have family for safety and to combine resources. Today it is important to have them for support, love, friendship and joy. Your family is the background for all that you do in life. They will celebrate your successes, cry with you in your failures and be there for you when you most need it. It is a system that works well to lift up and support those who need it. It doesn’t matter if you were born into the family you love, adopted into one, or created one yourself from friends. 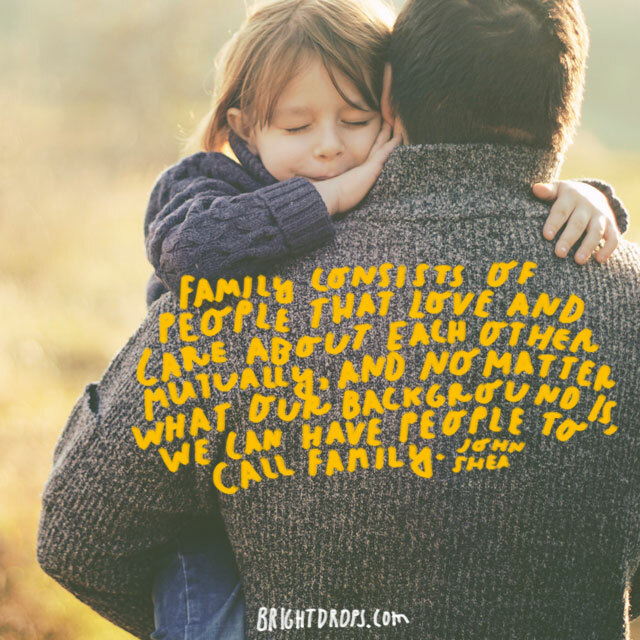 We all need family to call our own so that we might give and receive love freely. 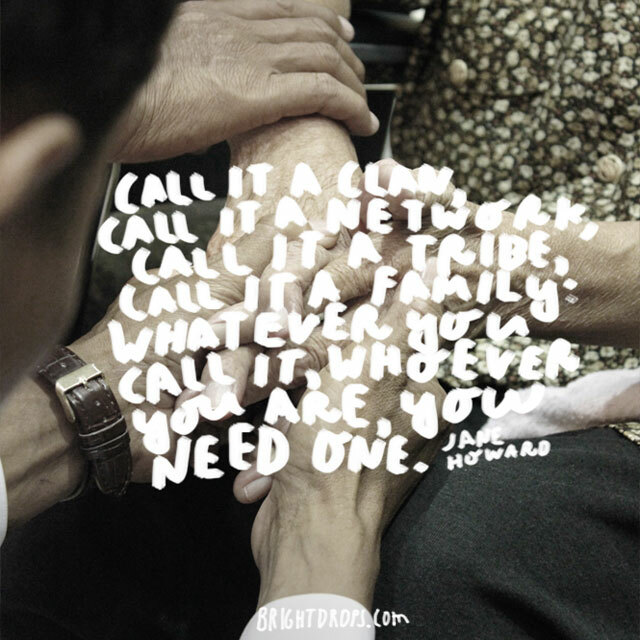 A network of people who love us can be the difference between life and death. The people we call family, the people who know us very well, are those that will be there in good times and bad while loving us all the way. Your family can be your biggest fans and supporters, as well as having your back when you need it. No family is perfect and they all have their imperfections. 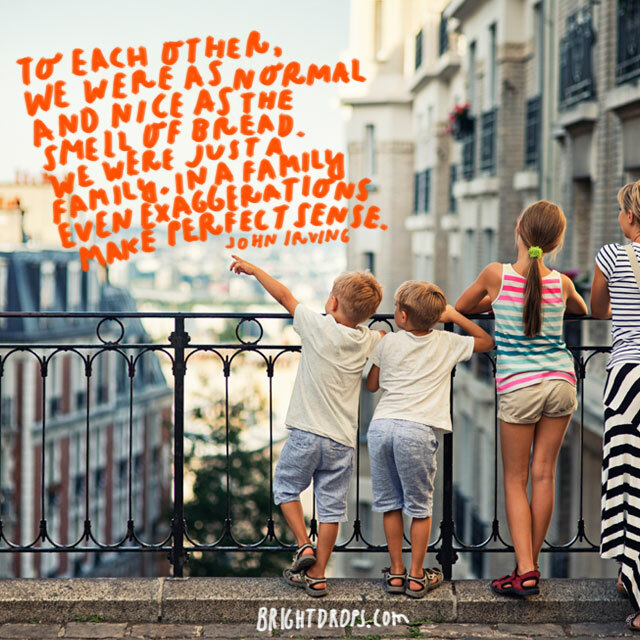 Being in an imperfect family helps everyone learn and grow. You can push each other’s buttons and tease to no end. 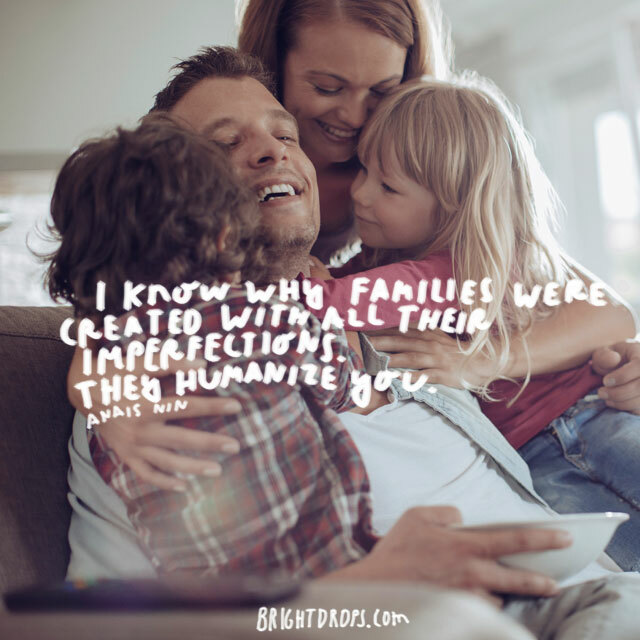 Your family strips away the masks you wear out in the world; you are raw and vulnerable with them. These stories can echo through the generations. 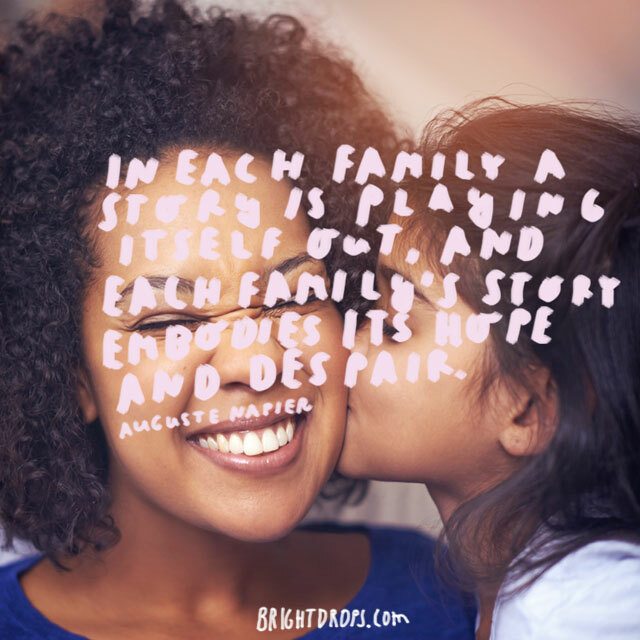 The hope and despair is there within all families. You have a chance to watch it play out, be a part of it playing out, and hopefully change the course of your ancestry by healing patterns of behavior, or creating great new ones. It kind of does feel like we are in a school when we are around our families sometimes, doesn’t it? You learn to be dutiful, loving and giving with your family. They are our greatest teachers throughout this life, as we are for them as well. It is easy to put on a good face for the world then come home and be cantankerous with our loved ones. 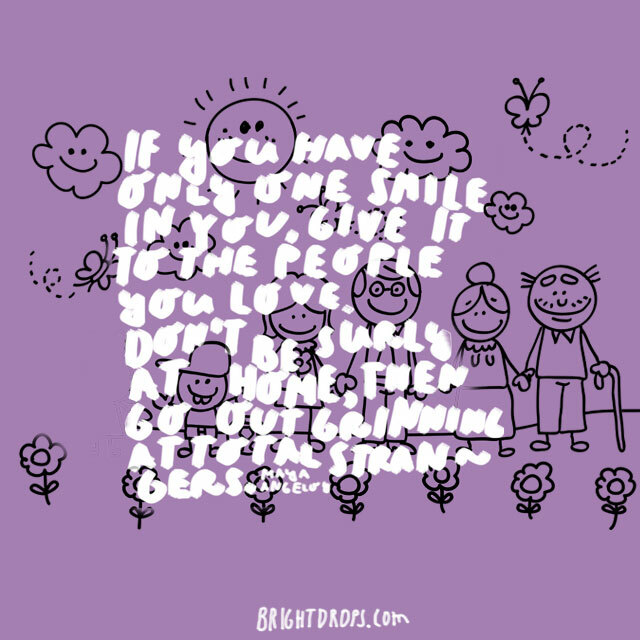 If you save your smiles and good moods for your family, that is ultimately more important than sharing it with strangers. 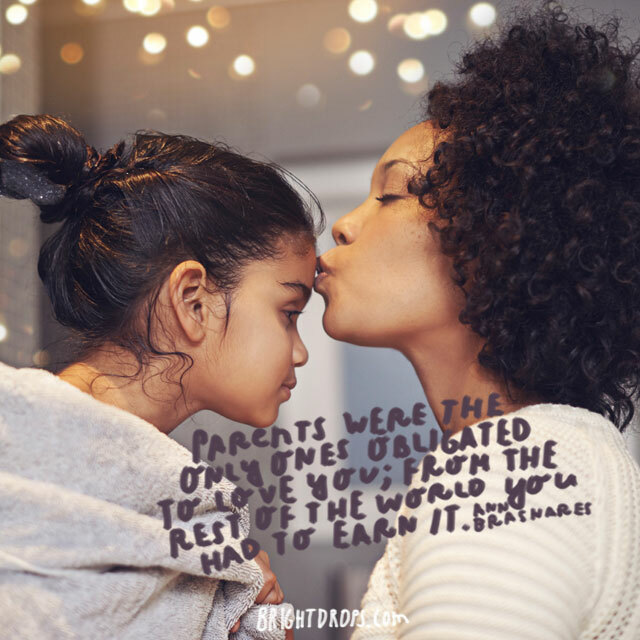 Our families deserve our best. Oh how true this is! You can let your hair down with your family, look like a slob, lay around, cry, yell, and do whatever is needed as you become your best. And the good thing is that they will love you anyway. If you have family that will give you an intervention when needed, keep you from harm, and watch out for you, then you are quite lucky indeed. 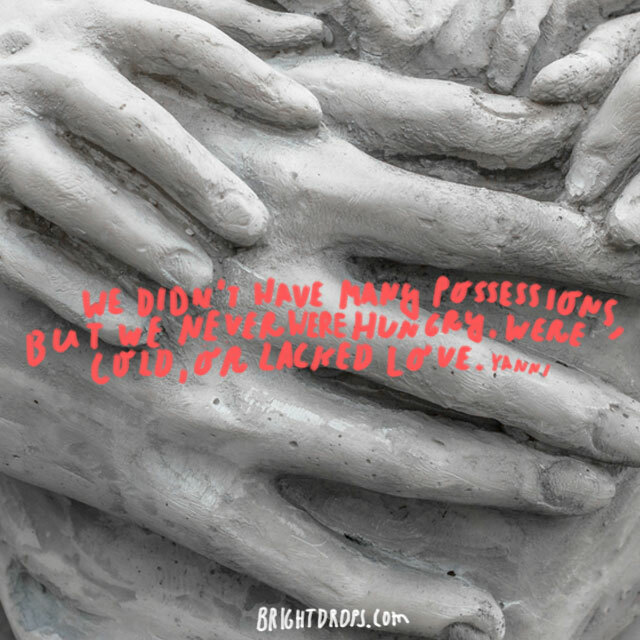 We cannot get the same thing from material possessions, so make sure to share some love with your family today. 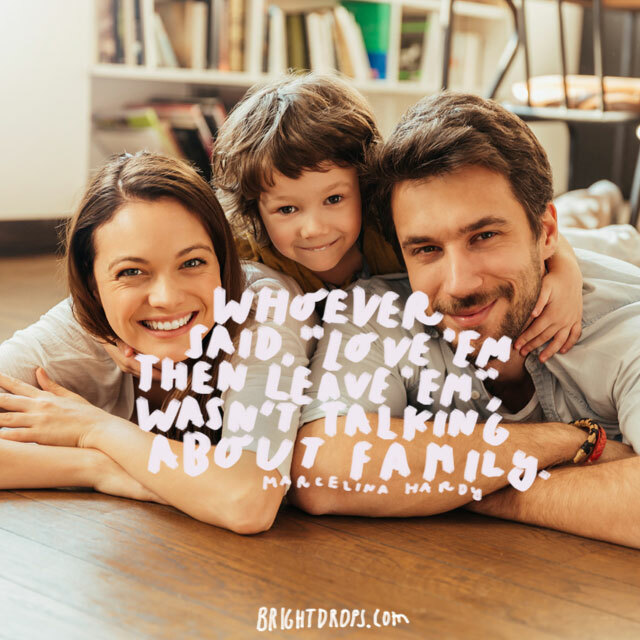 This quote works very well for family. Do the right thing by them, have fun with them, take advantage of every familial asset you can. 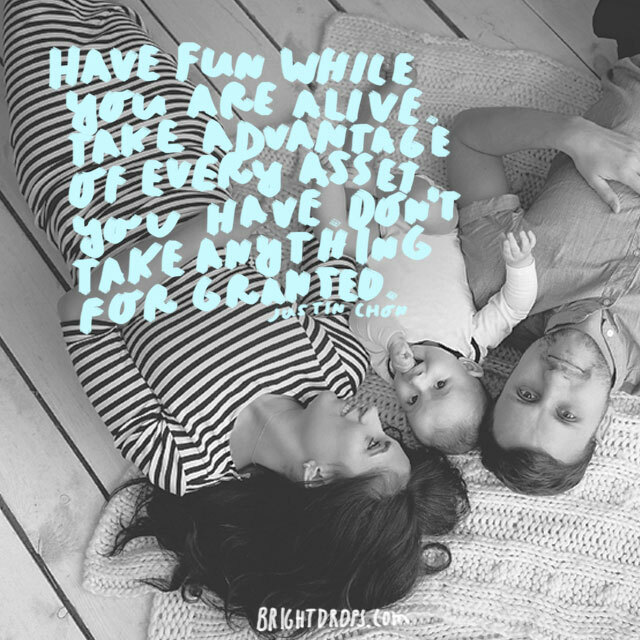 When you do these things, you are not taking your loved ones for granted and are sure to live a more enriching life. This could be your friends, neighbors, and co-workers to name a few. The people who will drop everything to come help you and be by your side are family. Those that support you in an unwavering sense are family. Family can be anyone who loves you deeply. 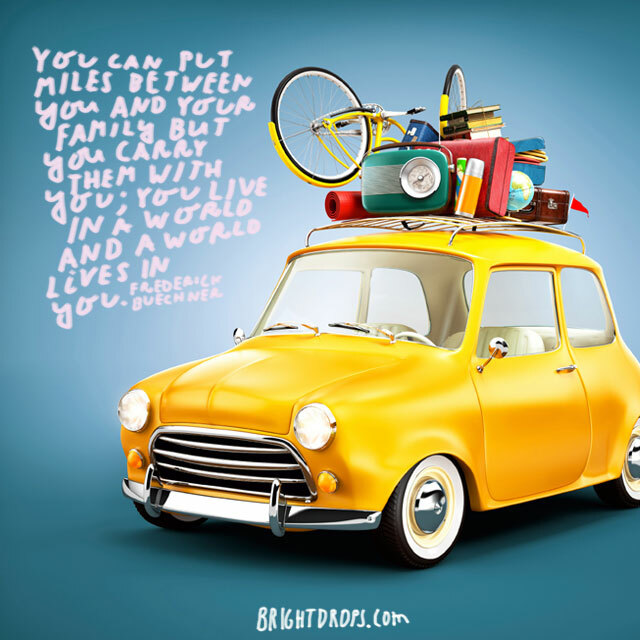 The world of your family will be with you no matter how far you travel on this Earth. Keep the love, the memories, and the lessons safe inside of you and whenever you might be lonely or in pain, take them out for comfort. You are never truly alone when you have family. 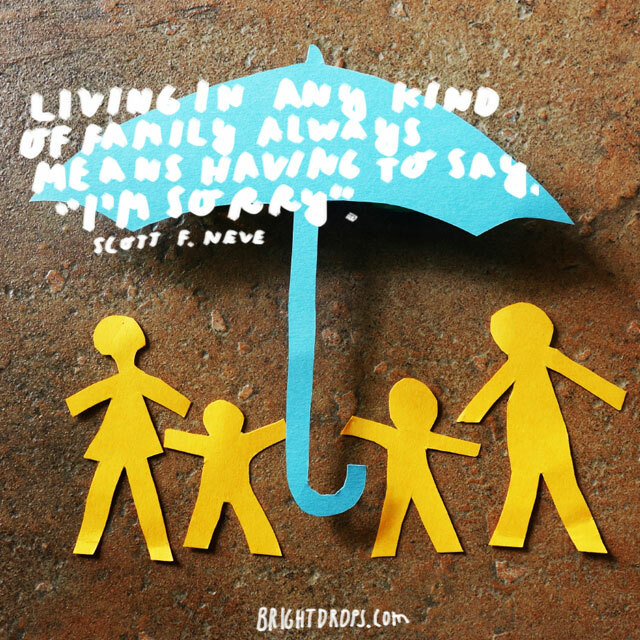 Your family knows just the right things to say and do to exasperate you, to make you laugh, or to drive you nuts. 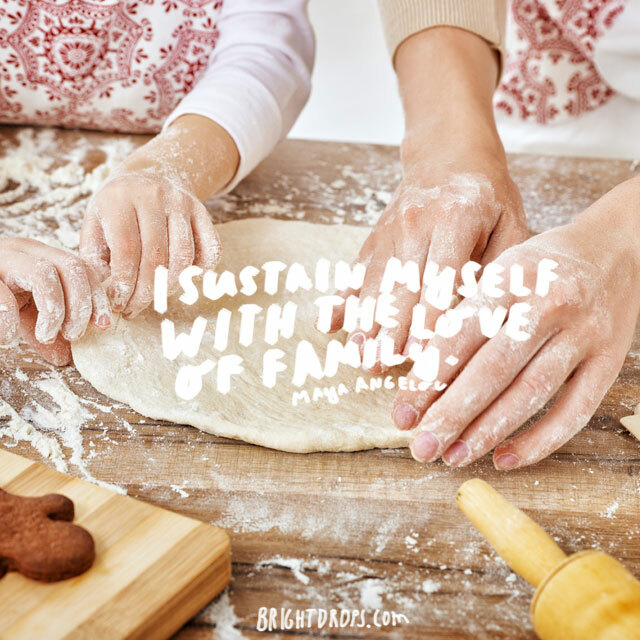 However, there is security in being with a family that loves you so intimately and deeply. 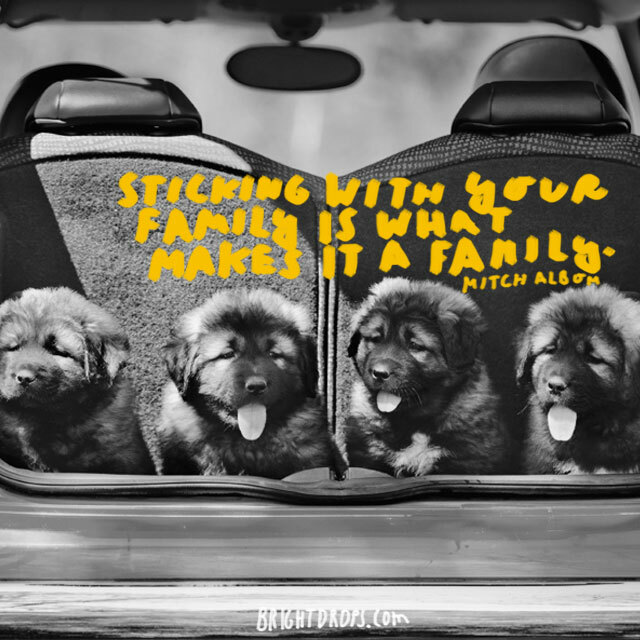 Even if they drive you batty, they are your family, make sure to never take them for granted. When you are up to your ears in troubles and challenges, your family will be there to support you in whatever way they can. This family can be one of friends or other loved ones you have selected. Regardless, they are on your side rooting for you. There are always going to be good times and bad times with family. You learn and gain nothing when you run away from them. Sticking together through all of life’s ups and downs is what makes them your true family. You can’t buy that kind of loyalty. 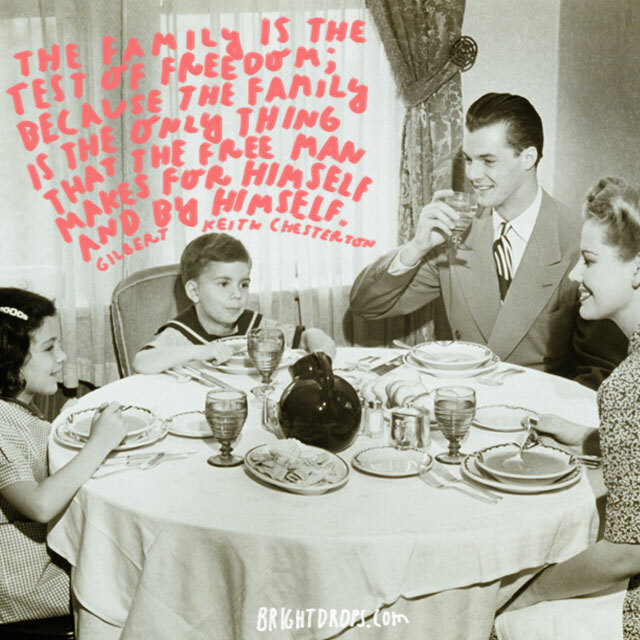 There are unknown reasons as to why you have the family you have. Even if you choose another family for yourself that don’t share blood, your bloodline will be with you no matter what. You can’t get rid of the DNA that created you so you might as well make the best of it. Being with people who love you is one of the most powerful things. You can be in another house, or another country yet still be with family and still be home. It’s a feeling that is carried with you and reinforced every time you’re with your family. 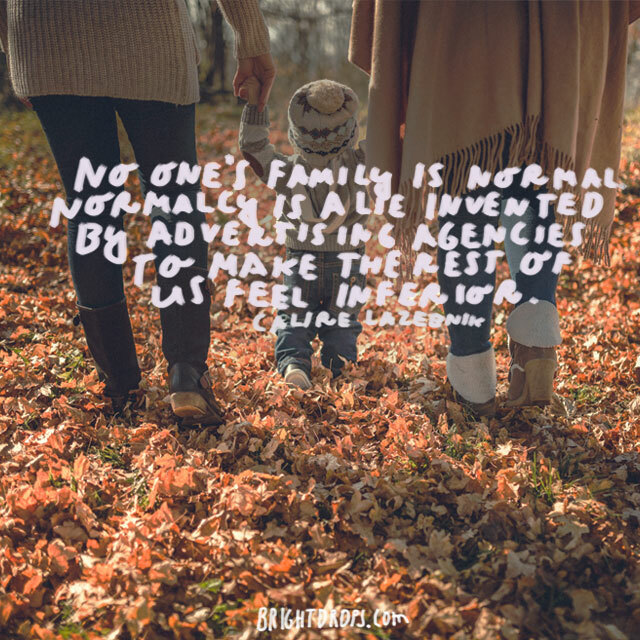 If you talk to other people you might be surprised to find out just how much they think their families are not normal. With so many personalities at play, there is bound to be some drama, some upset, some goofiness, and some non-normalcy. So accept your family the way they are and love them the best you can. 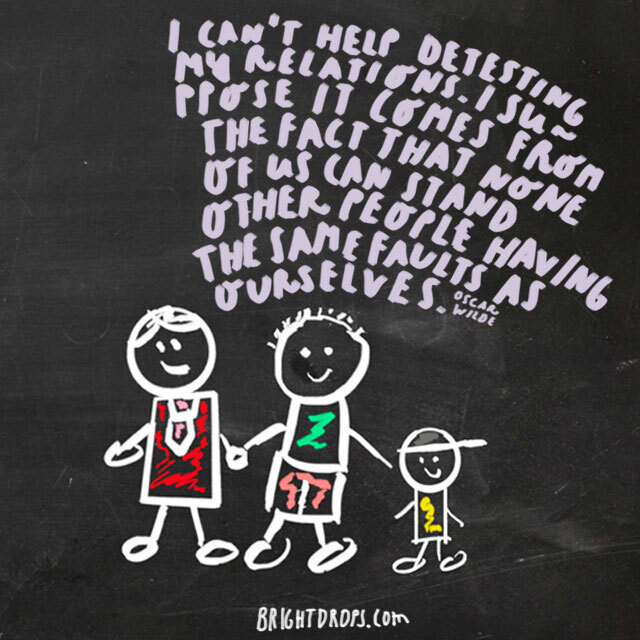 Our families love us the very most but sometimes we act very poorly in our homes and with our loved ones. They deserve better than that. Think to yourself how you would feel if someone else was treating your family the way you were. Would it anger you, or make you proud? 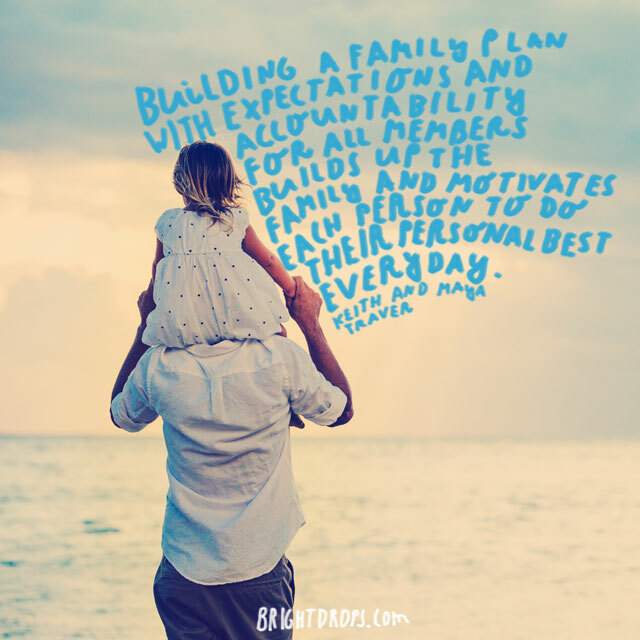 Families include some of the most resilient people. They are still going to love you when you are being a jerk, and you are still going to love them. This is called unconditional love. If you have people who will stand by you, no matter how you are behaving, then you are very blessed. 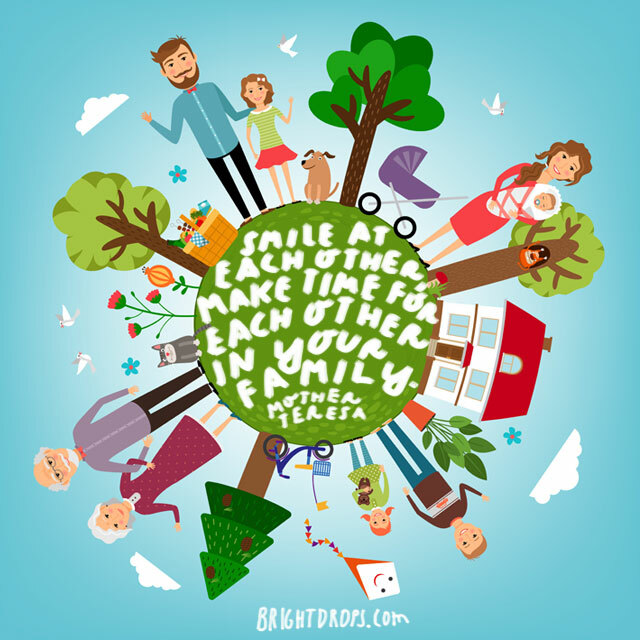 Smile at your family, create the time to spend together. It can be hard to connect with your family after long hard days but having dinner together, or sitting over a cup of tea to talk can be very healing. Remember to treat your family better than the strangers you meet throughout the day. It can be easy to let life just keep slipping by because you are too busy to stop and smell the roses with your family. 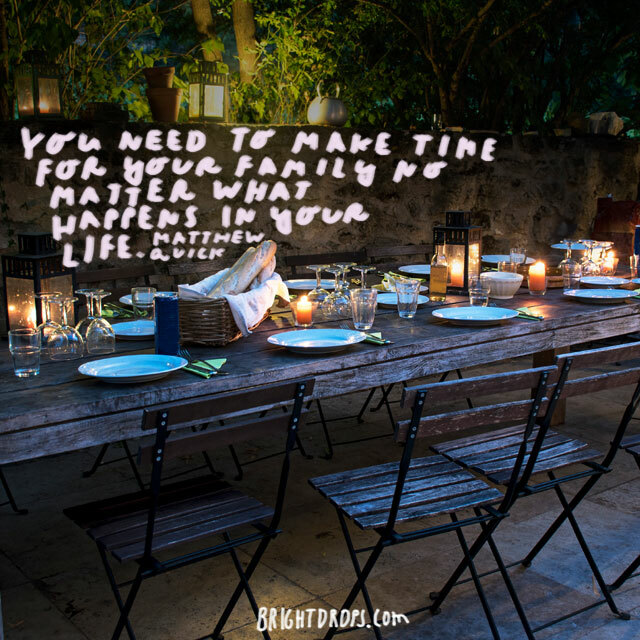 Make time to spend together because if you don’t, before you know it the years are gone and there is no going back. You should always be able to count on your family and they should be able to count on you as well. 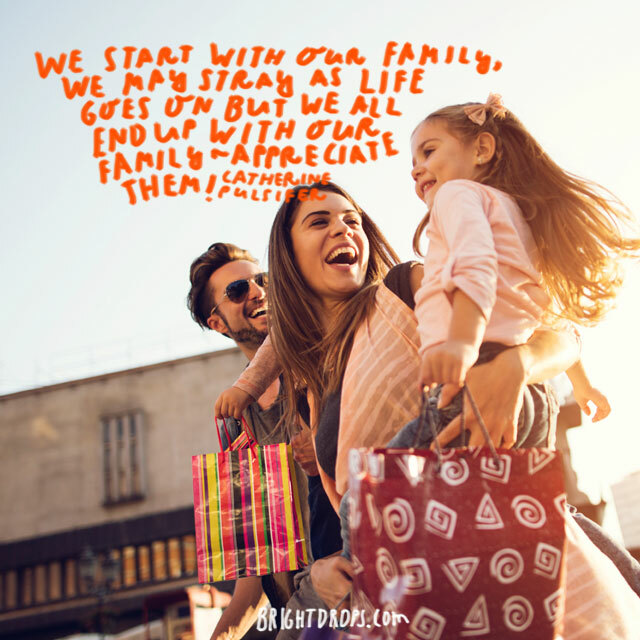 Family isn’t a group you created on Facebook, or an email list, they are the people who instinctively call when crap hits the fan or you need some extra support. 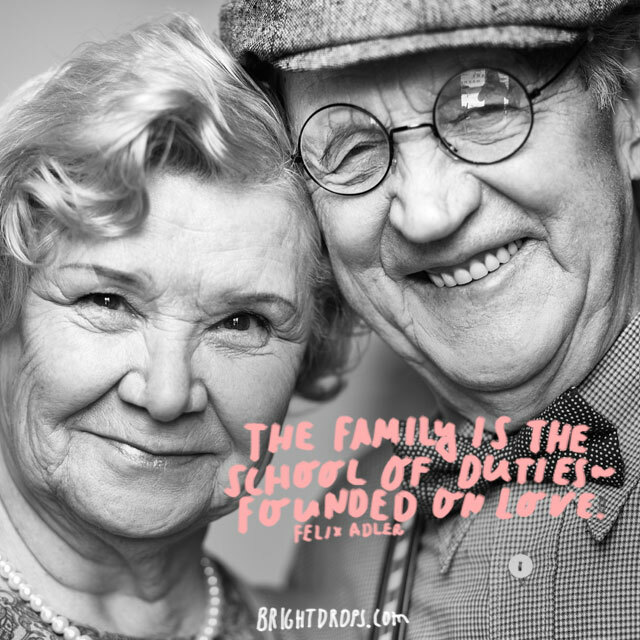 Your family can be your source of rejuvenation and comfort. In times of despair or utter depletion, you family lifts you up and brings strength to you. To get through anything exciting, challenging, or just plain big, the support and love of your family should be enough to sustain you through it all. 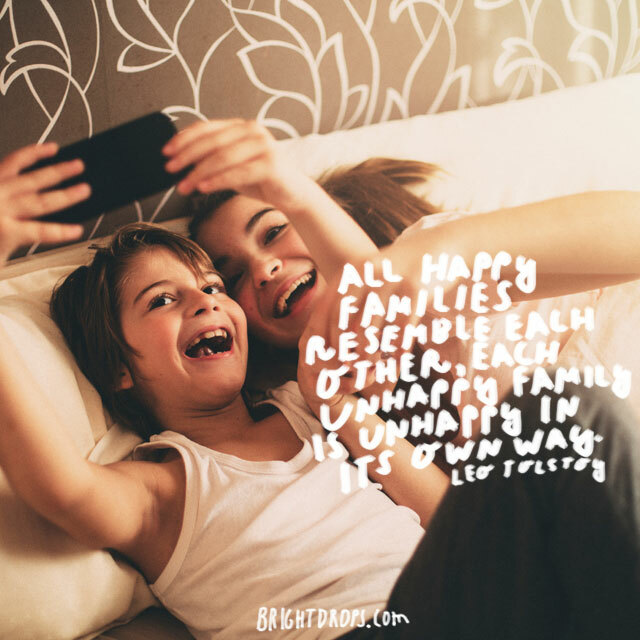 Shared happiness and unhappiness in families is easy to see in the faces of those within it. Each family has its own unique blend of personalities, ancestral baggage, joys and sorrows. 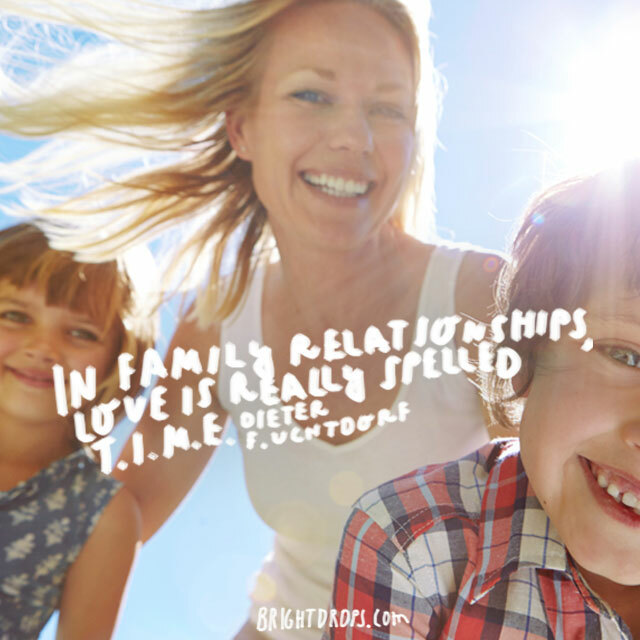 If you find yourself in an unhappy family, try today to love and forgive a little more. 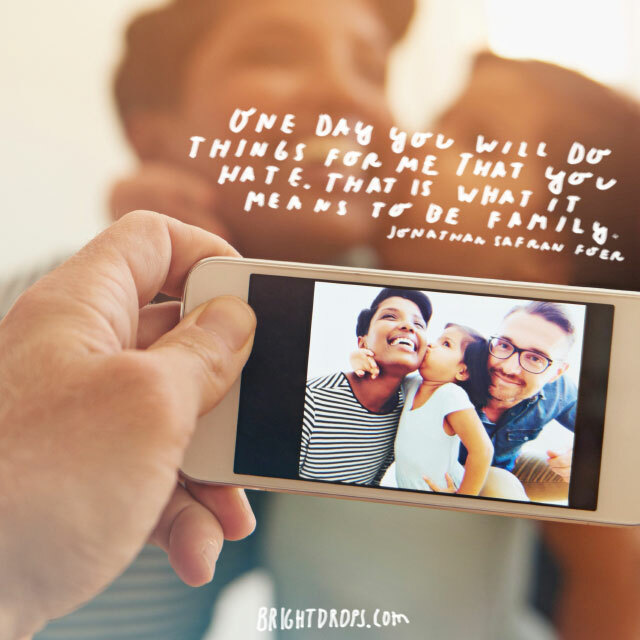 Family traditions are not only fun, but they bring connection and stability to a family. It also allows members to get together when the business of life could otherwise get in the way. 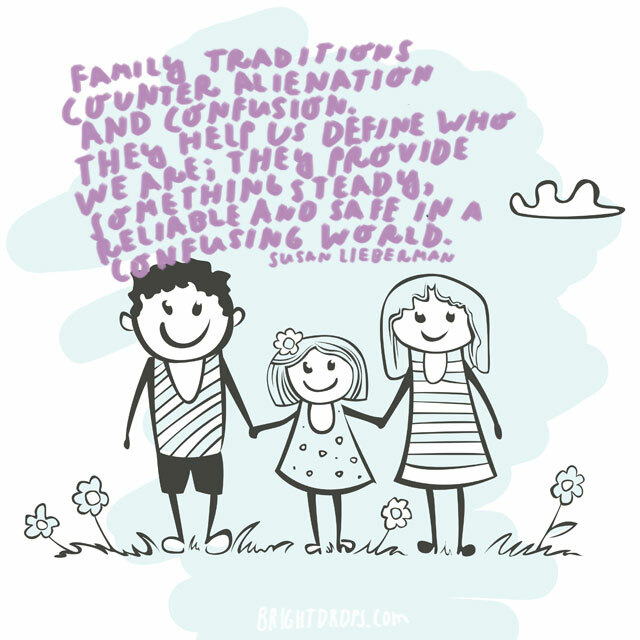 When we have a rough time out in the world, participating in family traditions give us a sense of belonging. This is so very true! If you have a family who would do anything for each other, is there supporting when support is needed no matter the reason, who show up for the important occasions and the not so important ones, then you are lucky indeed. You can’t have support, love, devotion, loyalty, respect or joy in a family unless every member is willing to help create it. 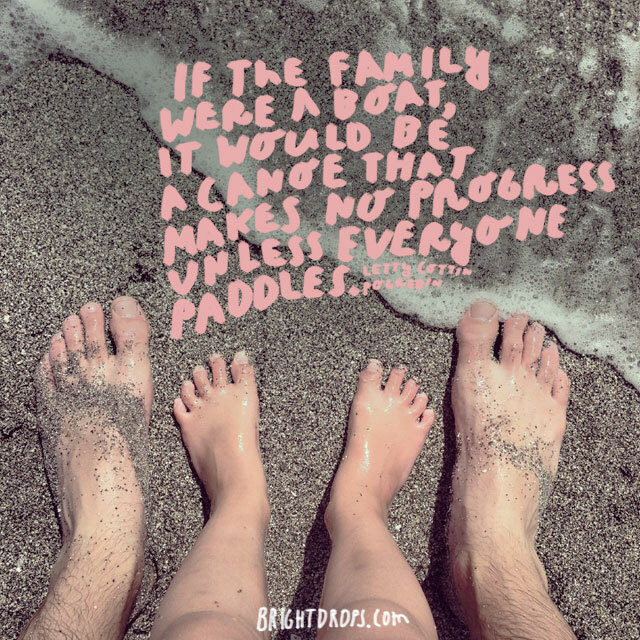 If your family is trying the best they can to paddle along as individuals and as a family unit then appreciate them for doing so. Each individual person can run on their own within a family, but the family dynamic of connection and love will not influence the family without help from its members. 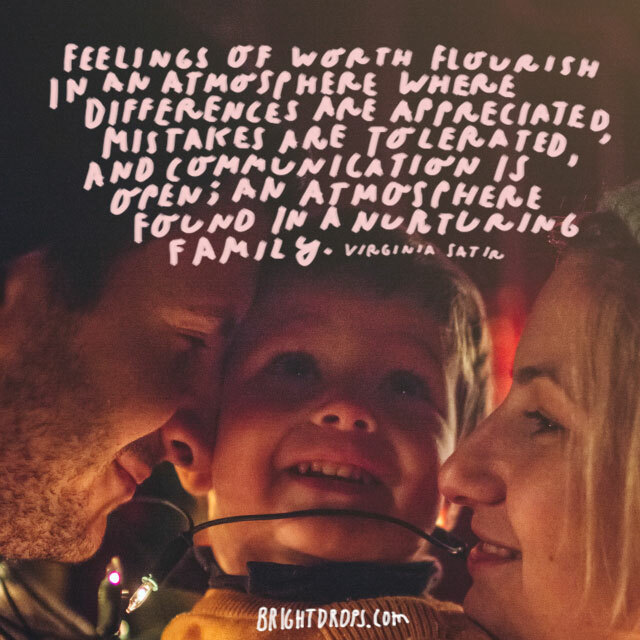 Input in the form of communication is essential to a healthy family; everyone must give input, must talk with one another, and be willing to check for emotional viruses. They are there to catch you when you fall, as well as put you back into your place when you start falling away. 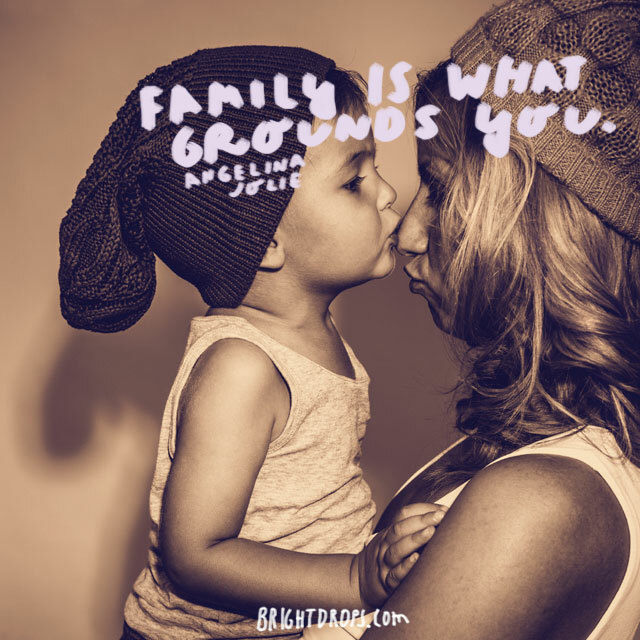 Your family is the grounding substance that brings you back to basics. 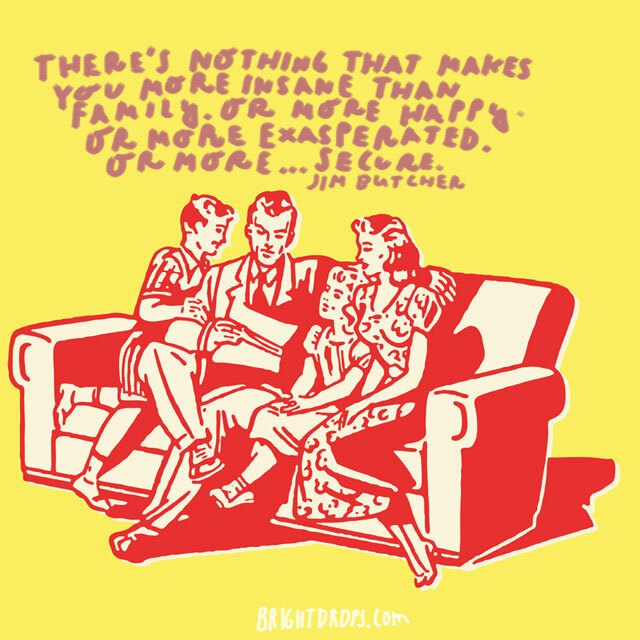 Having family to share or forget your troubles with is one of the best things. Your family might not live close but even if miles separate you, the connection of the heart still exists. The ever changing seasons of friends and lovers might leave you feeling adrift, but family is there as a constant to love and support you always. Be it pride or embarrassment, you might not ask your family for help when you need it. 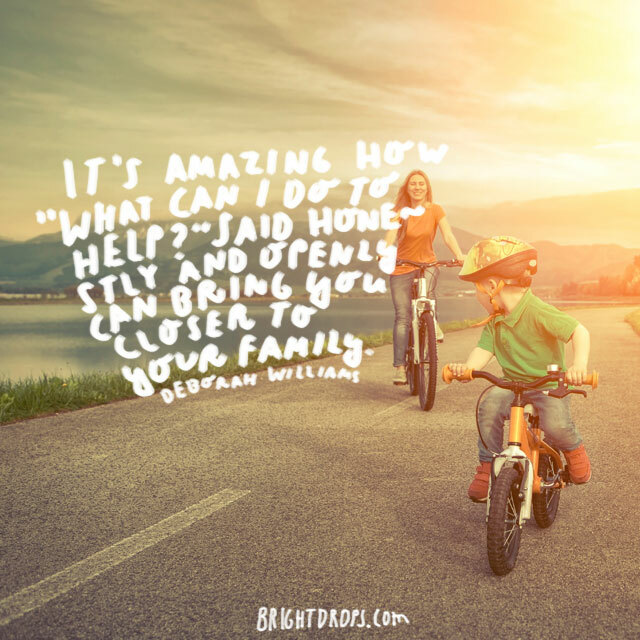 However family is often more willing to help than you might think. As a constant in your life, they are the ones that can best support you in the ways you need. Reach out and see what happens. 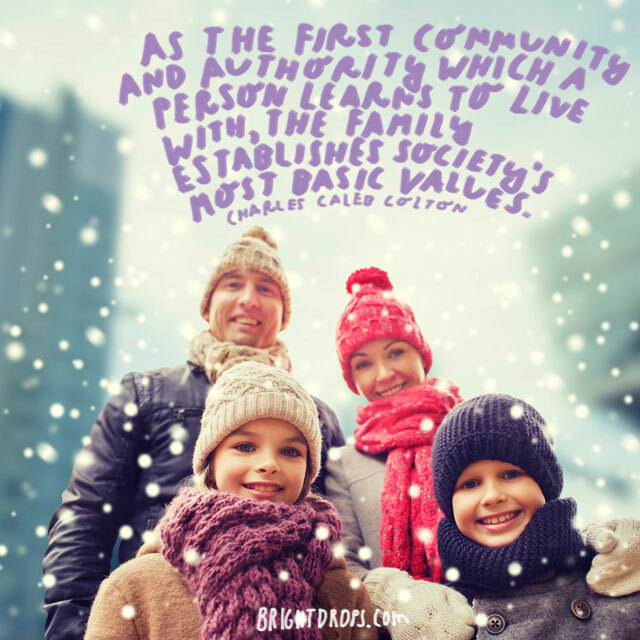 When you each have your own gifts, talents, and responsibilities within a family, a working structure is created that allows all to participate in. Having personal accountability is also a great way for each member to work on themselves and show up for the family in healthier ways. A happy home produces happy people. 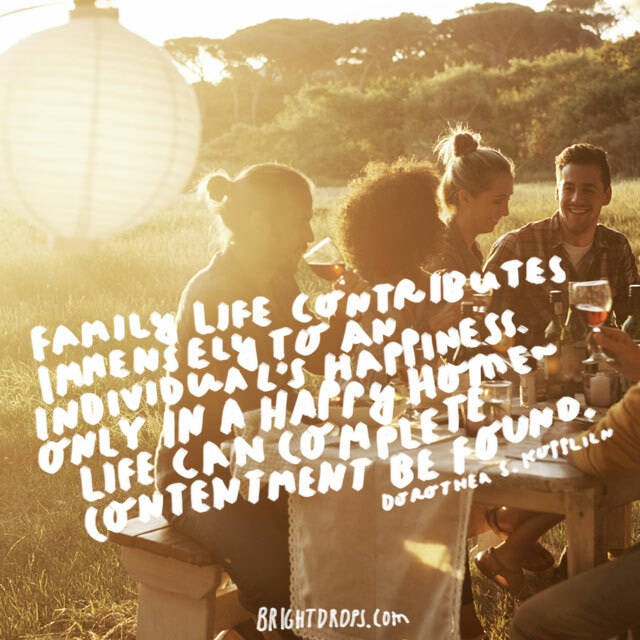 Contentment, peace, and joy are byproducts of a stable and healthy family. 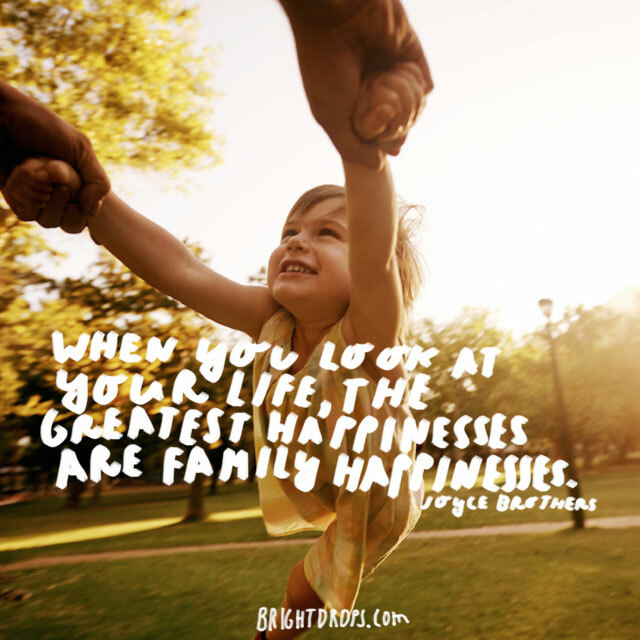 Keep in mind that all families go through unhappy times periodically, but that is what makes us grow. If your home is not so happy, search out ways to shift the energy and lighten the home. 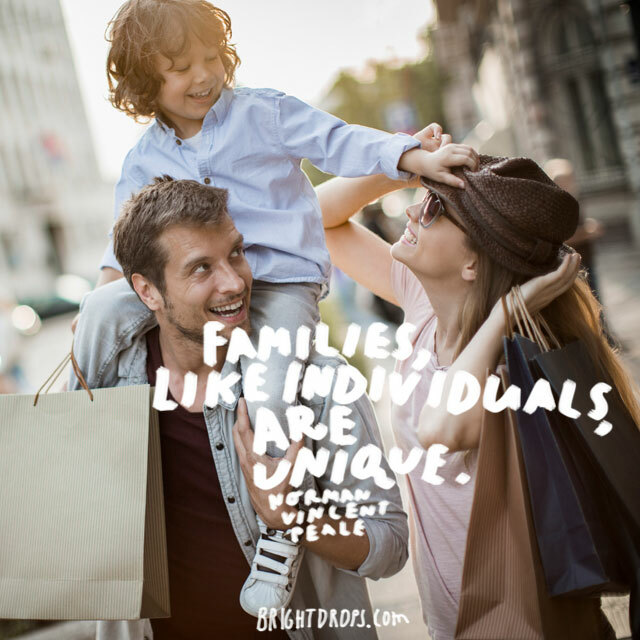 Because of the range of personalities within a family, each one is more unique than the next. If you doubt this then just watch your own family, or one out in public, to see just how differently they dress, speak and react to things. It’s true that they resemble each other in ways, but each person is just one piece that makes up the family puzzle. 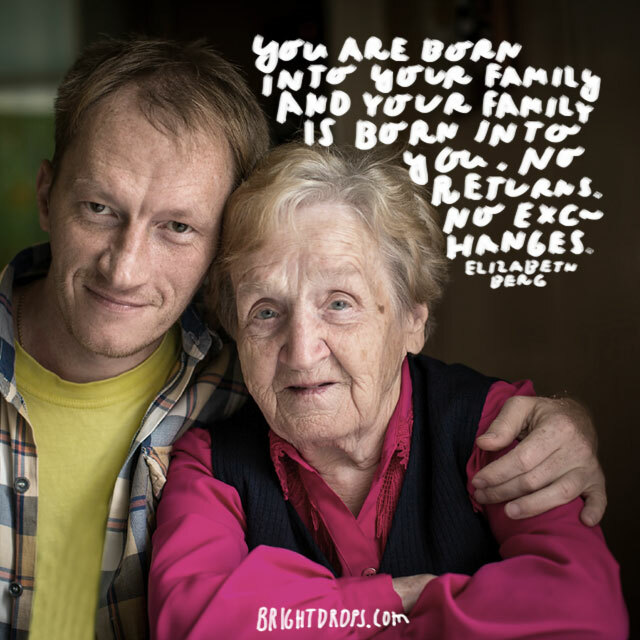 Your family doesn’t have to be the one you are born into, you can create a family from anyone that you love and care about. Having a group of people that you see frequently, can count on no matter what, and that you might die for, is what makes them family so don’t take any of them for granted. From the time we are very young we mimic and copy the behavior of our parents. Even all grown up you are probably a lot more like your parents than you would believe. So next time you are angry with your parents, examine yourself to see if you aren’t guilty of the same thing. Life has its ups and downs, it’s true. However, sometimes you get dealt a blow and it might seem like all hope is lost, but look to your family. They are there, just waiting to support you and when life gets stormy, they are the ones to lift you up and keep you afloat. The love and devotion shared by family members is a treasure for sure. The beauty exists in the hugs during quiet moments, the raucous laughter when joke is told, the arguments that bring out growth and healing, and the unwavering support they give each other. 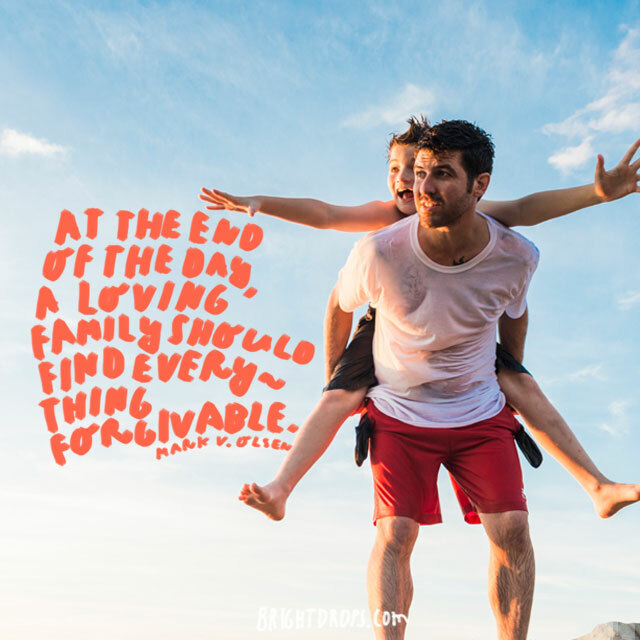 Find the beauty in your family each and every day. 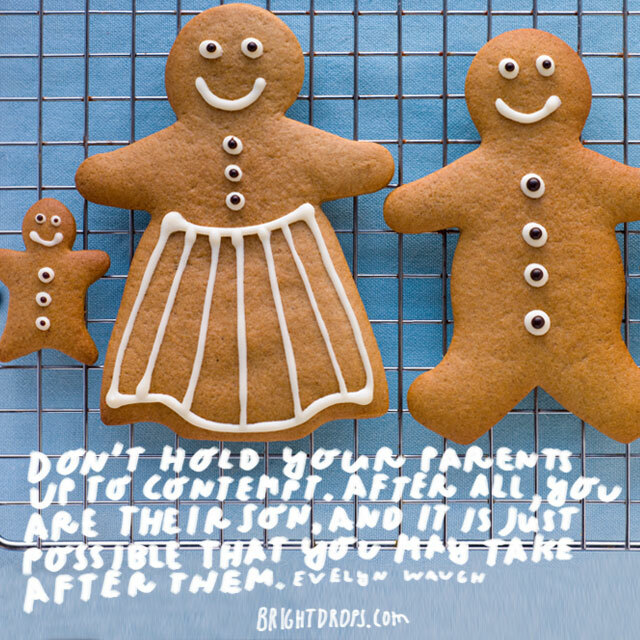 When you are with your family you might sometimes take them for granted, put your foot in your mouth, or behave less than loving. Sometimes we hurt each other most, but if your family apologizes when they are wrong, then you are ahead of the game compared to many people. 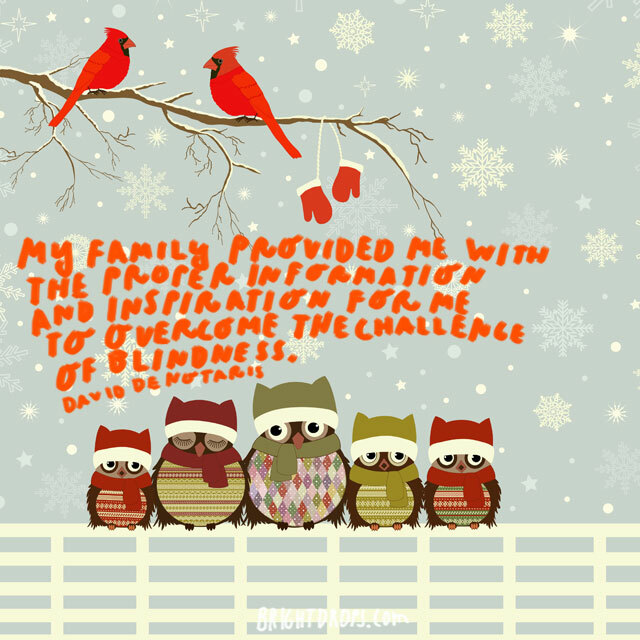 Any challenge you might experience can be overcome with the help and love of family. It is your family that knows the intimate details of your life, and it is your family that will know how best to help you. Lean on these people and let them be there for you when you most need it. 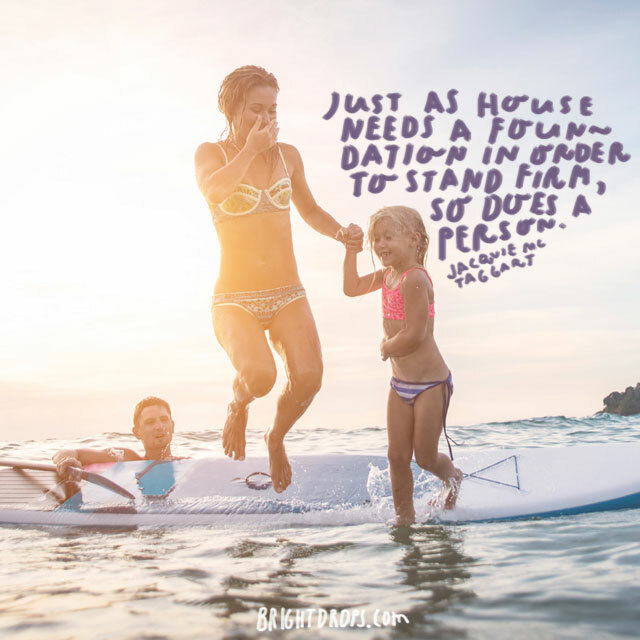 It is not possessions that make a home or a family, but safety, security, and love. A family can be rich or poor and be either happy or miserable. Family needs love more than it needs material items. 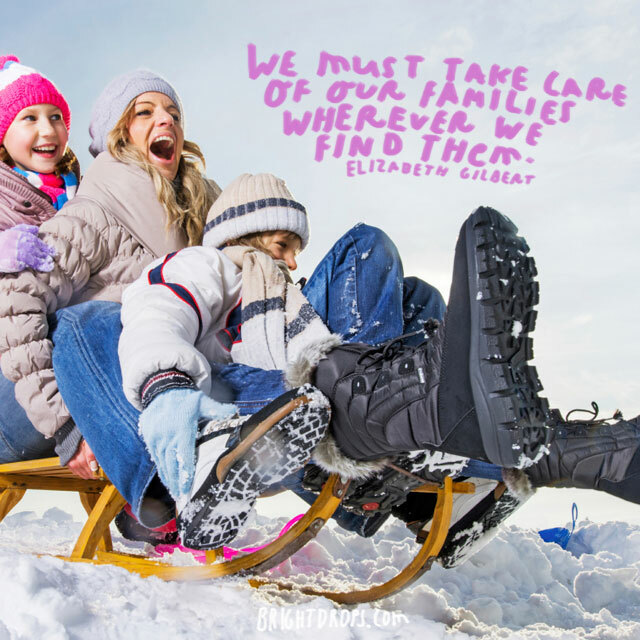 If your family is healthy and cared for, then that is enough. If you are close with your family then you are probably good at sensing when one of them needs help with something. Not everyone is comfortable asking for assistance, so when you notice your loved one struggling, simply ask them what you can do. 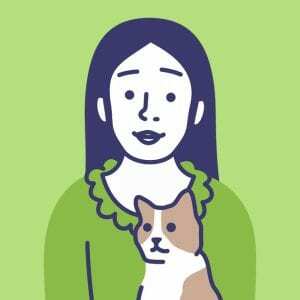 Being offered help can be a stress reliever in and of itself. 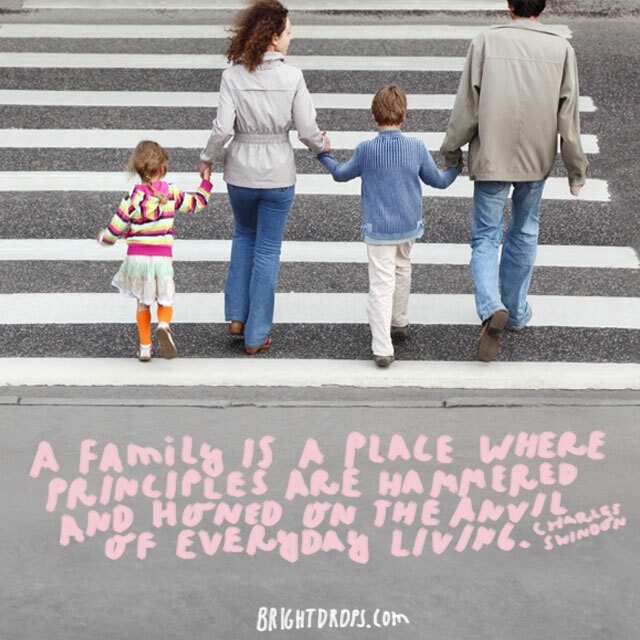 Life may take us in any number of directions away from our family, both physically and emotionally. Even if there is distance between you because of miles or anger, family is there in the background and will be there for you at the end. 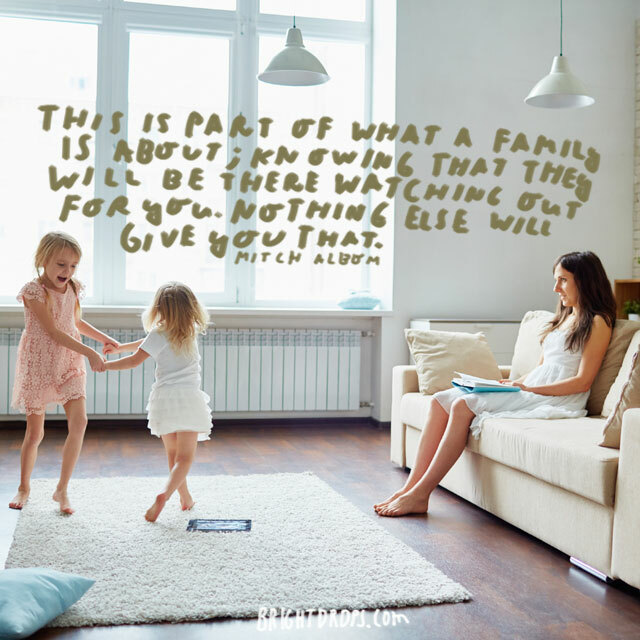 Do what you can to keep your family close to you. 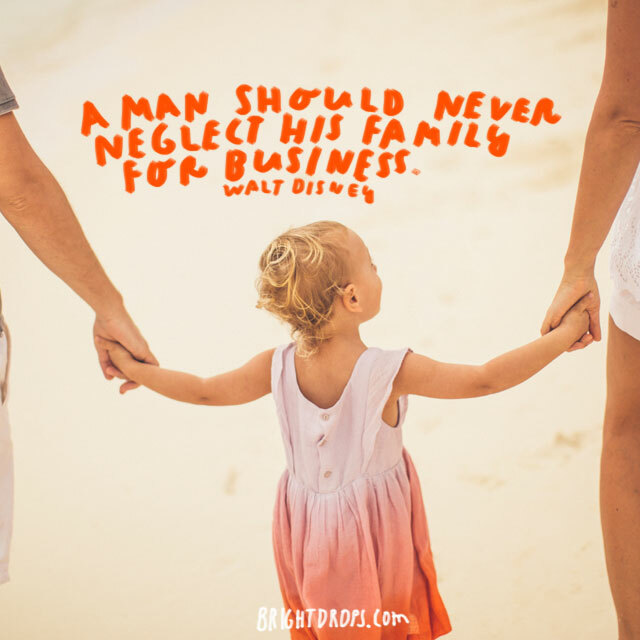 You might be busy making an income to feed your family, or building a business, but your family needs love and attention too. Don’t take for granted that they are there and always will be, seize the moment and spend quality time with those you love. 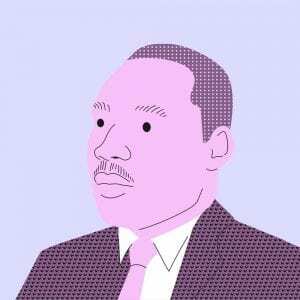 Love and knowledge are the only things you can take with you when you die. 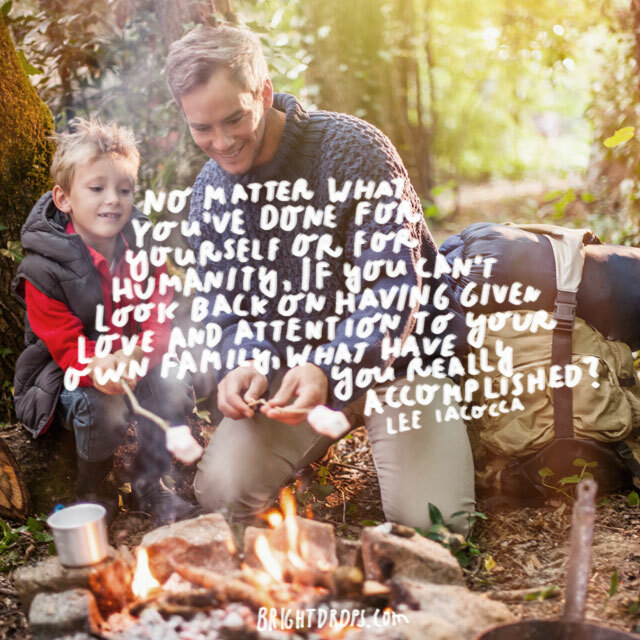 Don’t spend a lifetime collecting things, collect the love from your family and make sure to give it back tenfold. Being able to say that you loved your family with all your heart is true success. What might look strange to an outsider seems perfectly normal to you. Your family is the place where you can let your hair down, joke around with, and exaggerate to people who will see right through you. But those are the best kinds of people, don’t you think? 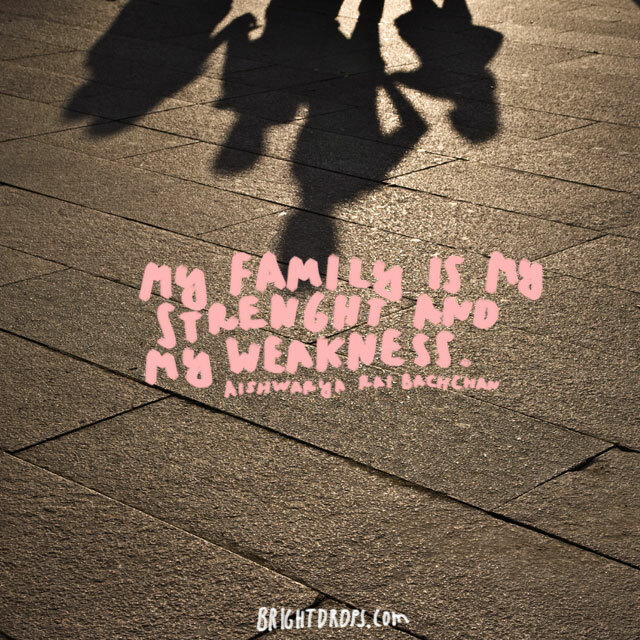 This is one of the best quotes about family. 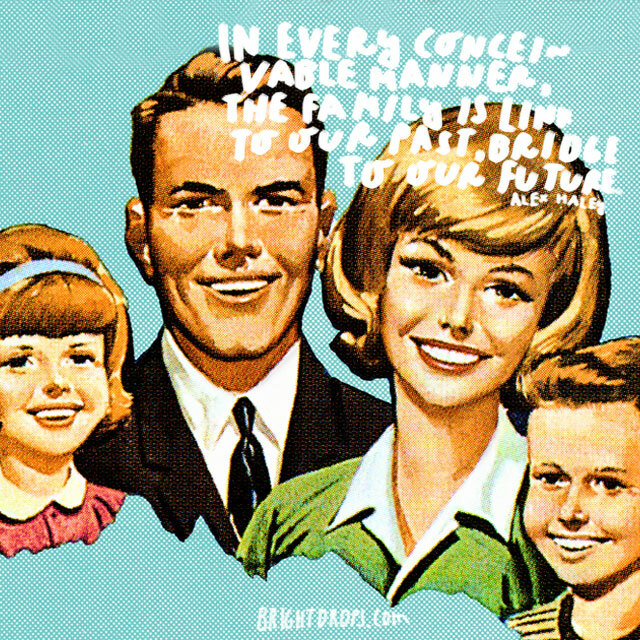 Everyone must contribute to the happiness of the family. When we are in service to each other, there is a profound ripple of gratitude and love that can be felt within the walls of the home. Do something nice for someone in your family today. Go out into the world and blaze your own trail. Create magic and success then come back to your family to share with them what you have learned. 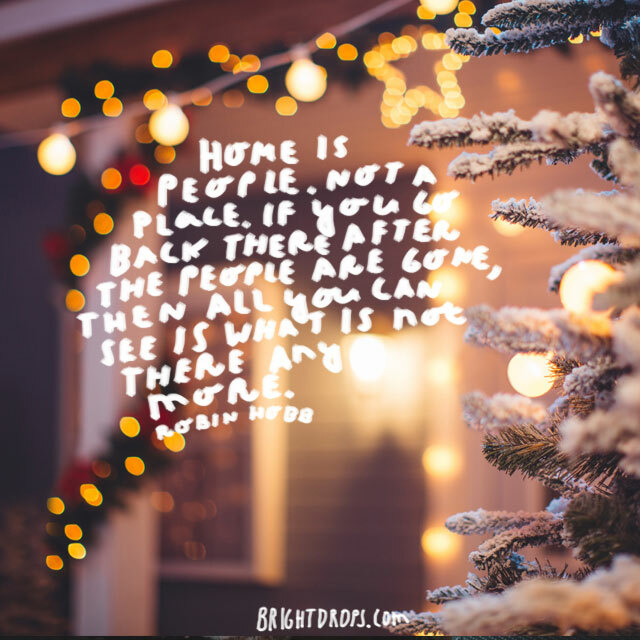 The best people to pay it forward to are your loved ones, so no matter what you have collected, bring some back home to your family. 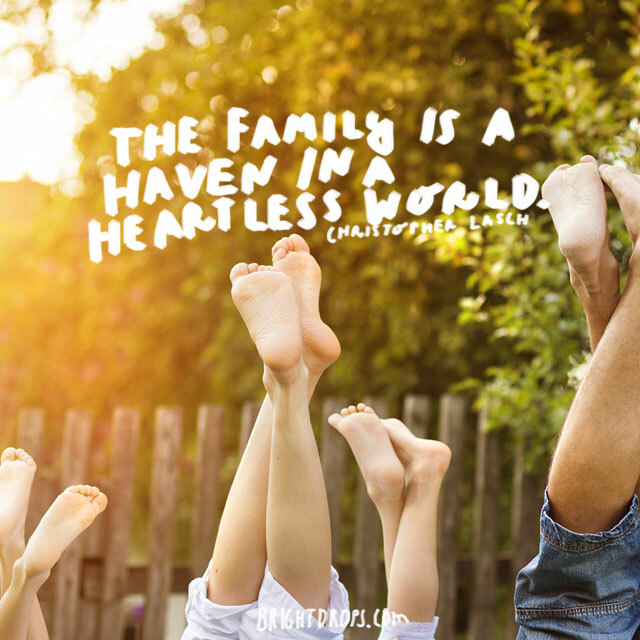 If the family is healthy and stable, then that ripples out into the community and the rest of the world. Many crimes are committed by people who were not taught the concept of respect and love at home. Make sure that your family is an expression of what you want to put out into the world. No matter your age, your family can help you learn to give and receive love, and you can help them as well. Sometimes it takes a while and sometimes the process is messy, but there is no more important goal in family than this. You experience many things with your family and I’m sure you’ve had times that tested your principles. The everyday occurrences of life are great teachers, so allow your family to be a tool to help you grow into the best version of yourself. You need to have a stable place to call home, and stable people to call family. 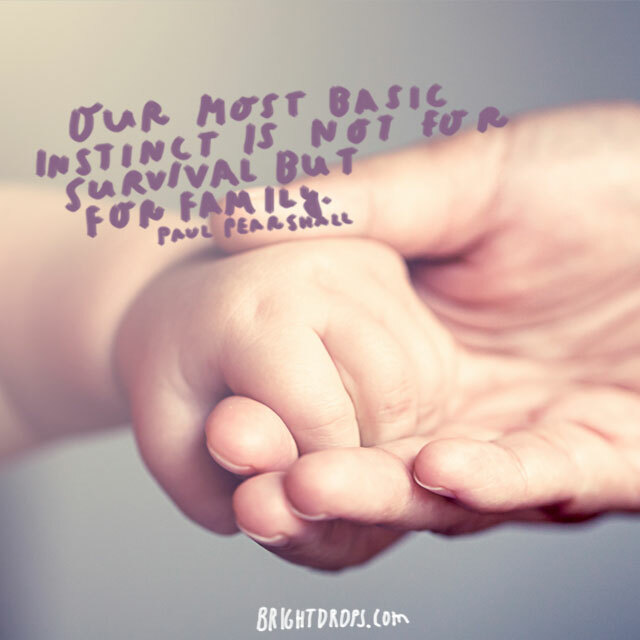 A strong familial base helps foster trust, stability, support, and love. To be well built and strong, surround yourself with your loved ones. Lean on them in your darkest times and you will see the light. 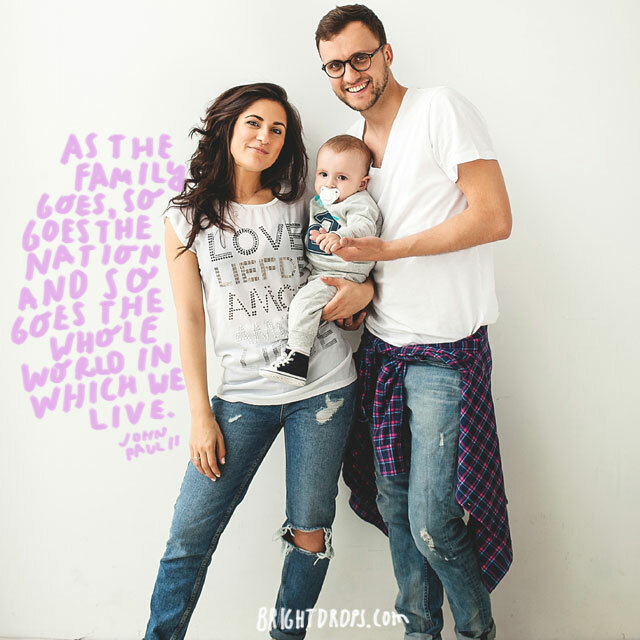 When a nation’s people are happy and well adjusted, you can often find a healthy supportive home atmosphere in most families. 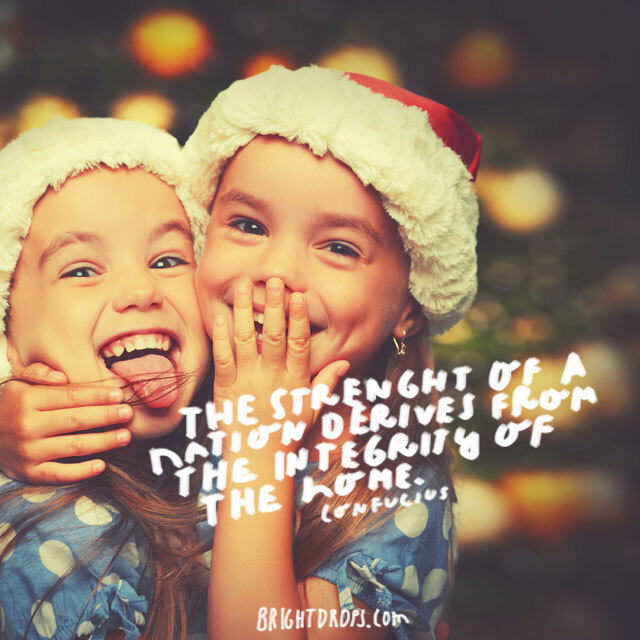 Think of strengthening the integrity of your family to assist your own community and nation. It might not seem like much, but it is what society needs. 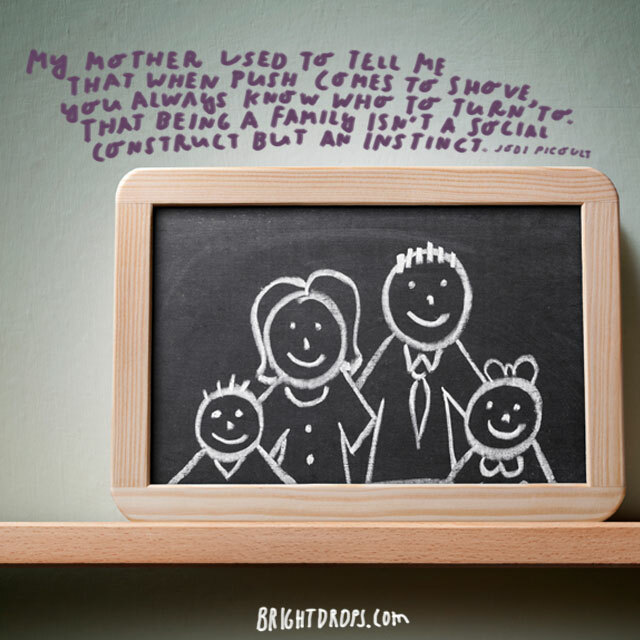 If your mother scolded you more than kissed you, just trust that she was doing so because she loved you and wanted to keep you safe, as well as raise you well. 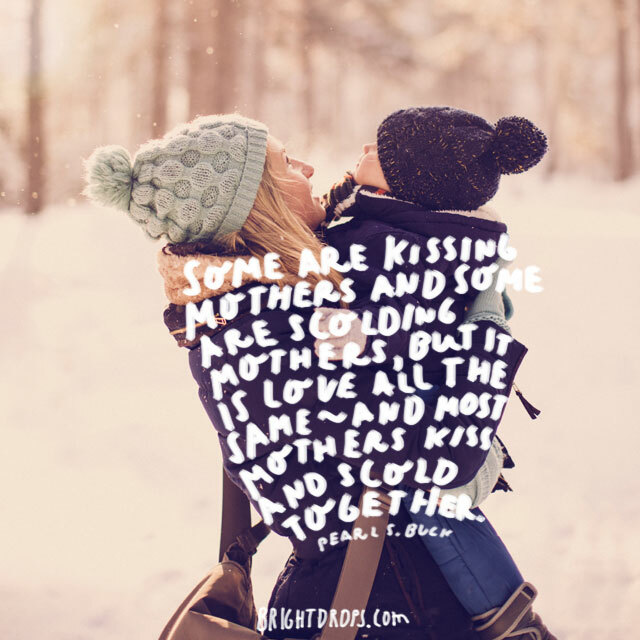 Kisses are easy but scolding veils a fiercely protective agenda in mothers. It’s been said that what we don’t like in others are things we don’t like within ourselves. We grow up resembling our family in behavior more than we’d like to think. You exist within your family and they exist within you, so work on being patient with not only their shortcomings, but yours. With the same DNA, and often with the same living arrangements, we end up sharing looks and behaviors with our family. 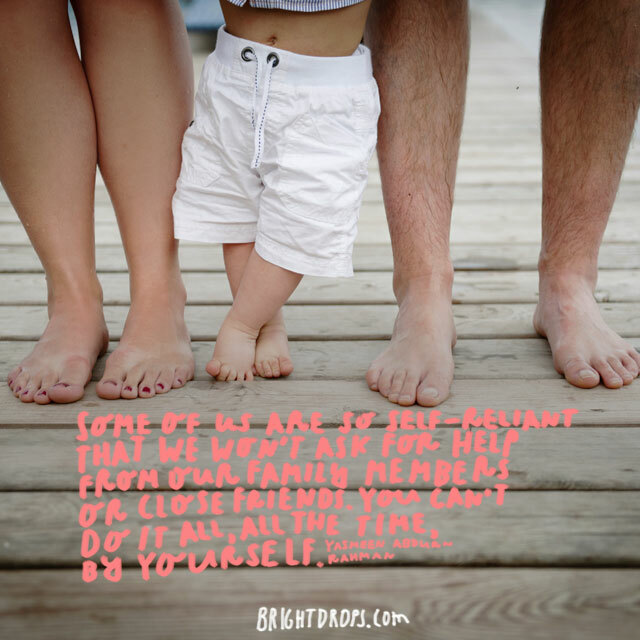 There are different versions of you within all of your family and vice versa. 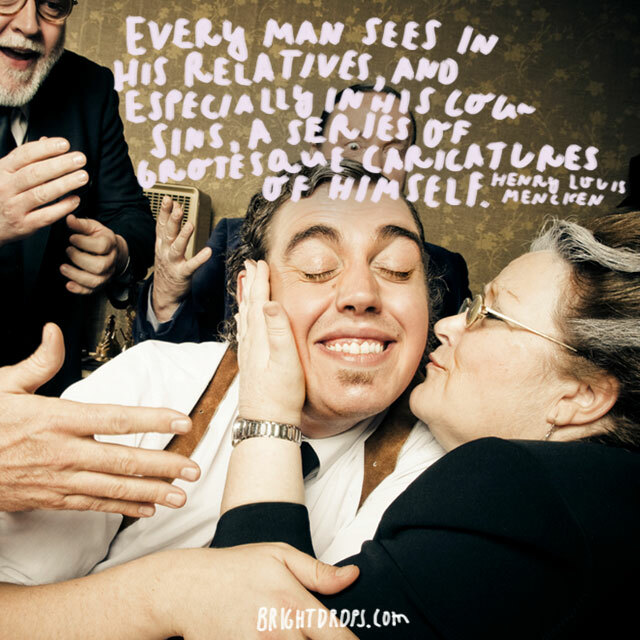 Look for the connections and the humor within your family to stave off any resentment. The bigger the family, the more you have to love and lose. However, with a large family you can find lots of joy and love as well. It is not worth avoiding family and not having love just so you don’t risk sorrow. Nothing ventured, nothing gained, right? 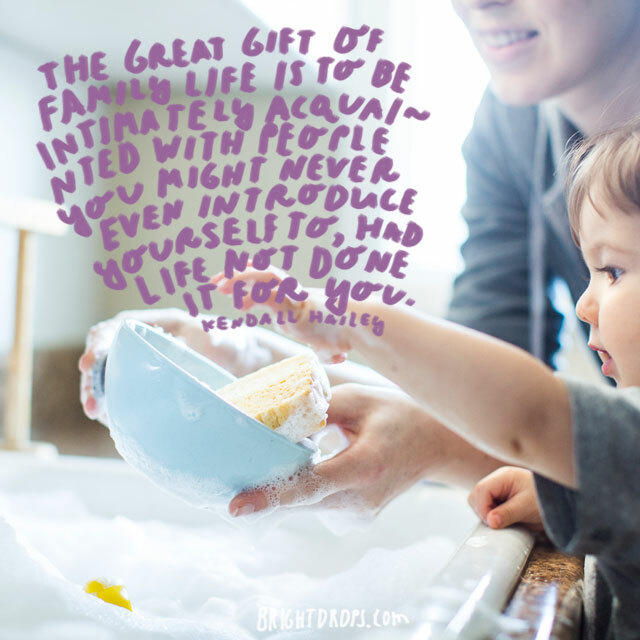 When you decide to create a family for yourself be it by marrying and having children, or collecting friends around you as family, you have created it for your life. It might not be ideal at times, but love the ones you call family and seek never to take them for granted. 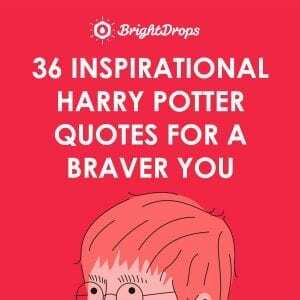 Family quotes with this same basic meaning are found easily. 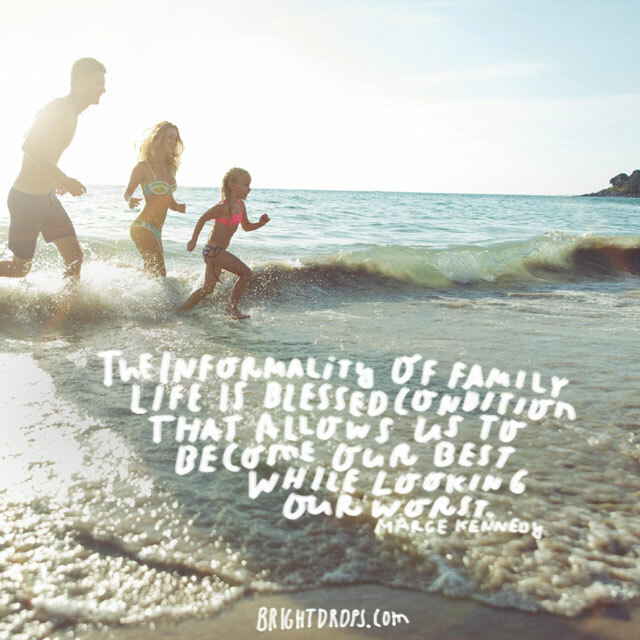 It stands that the family, no matter the dynamic, affects society as a whole. Examine your family to see where you might bring more love and harmony to it, and know that you are helping society heal in the meantime as well. You can have one without the other, but why would you want to? 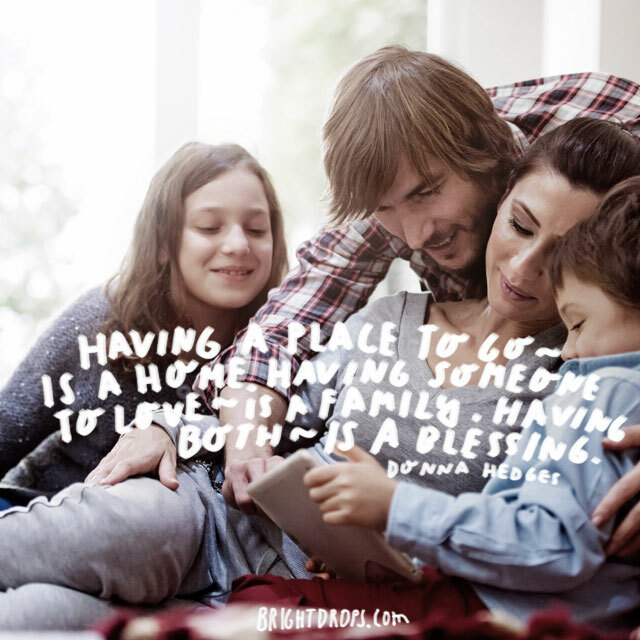 Having a home and people to love is a true blessing so make sure you don’t take your family for granted. It is easy to lose both in this world of sudden change so love them while you can. You might wonder if you would ever choose to befriend those in your family if you were not born to them. Even if the answer is no, they are here to teach, love and guide you. There is no going back so make the best of it and love them fiercely. 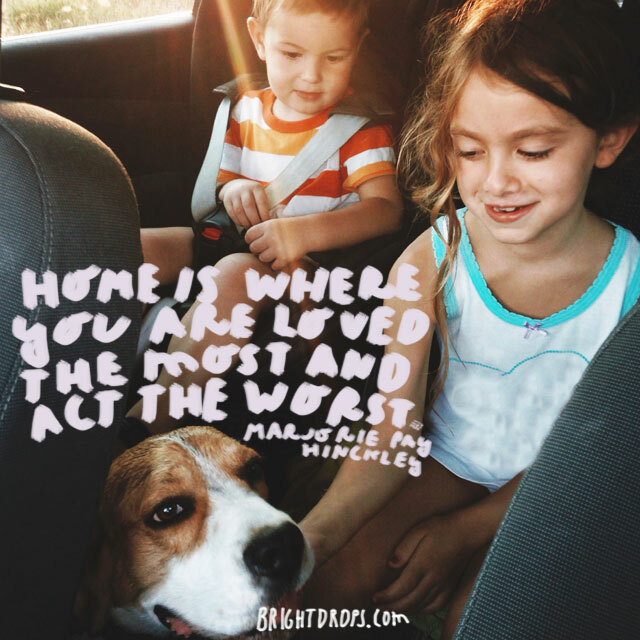 What does it matter if your family inherits your home, your car, your money, if they are not loving and well-adjusted people? 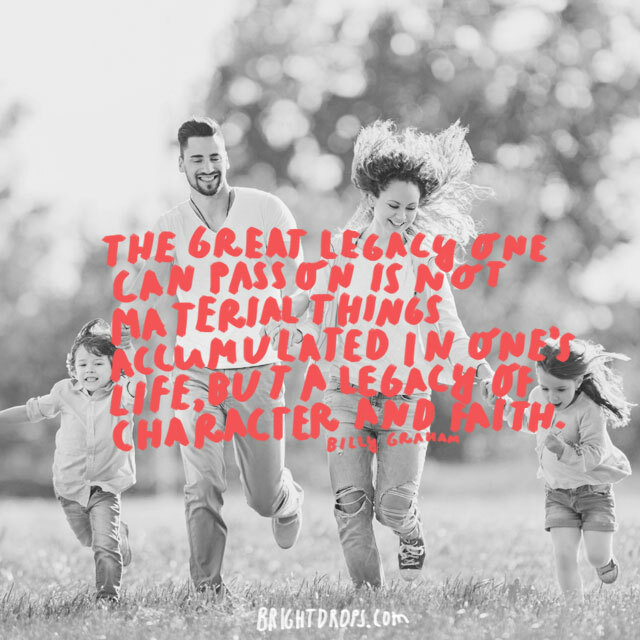 Teaching those you call family to love, be loved, have strong character and faith in things unseen are more valuable than material possessions. Loving and leaving them is more painful when it is done to a family member. You might not always get along with your loved ones but it is worth loving them, no matter what. Just as you want and need support at times, so do they. Your family is instrumental in making you into the person you become, but since they are the people who know you the best and know how to push your buttons, they can sometimes make you into who you aren’t. This can either be for the positive or the negative, but it happens regardless. 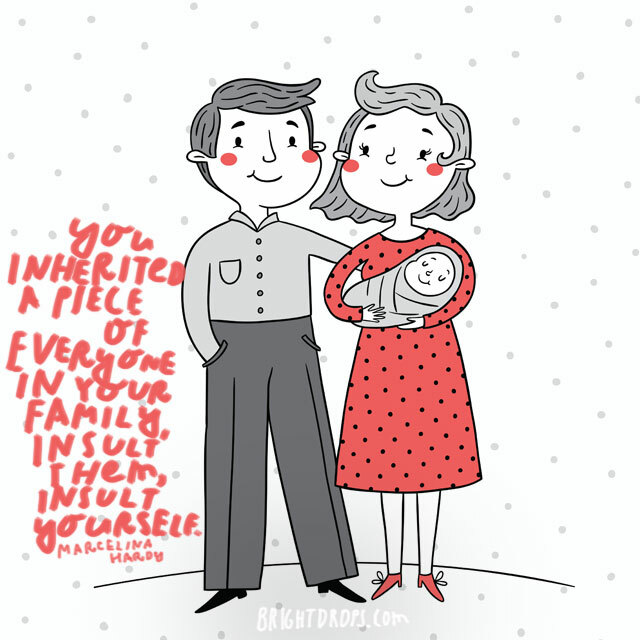 You are more like your family than you might realize. Since that is the case, if you put them down, then essentially you are putting yourself down too. You all share behaviors, traits, and blood, so be gentle and forgiving. This way, you are honoring yourself as well. 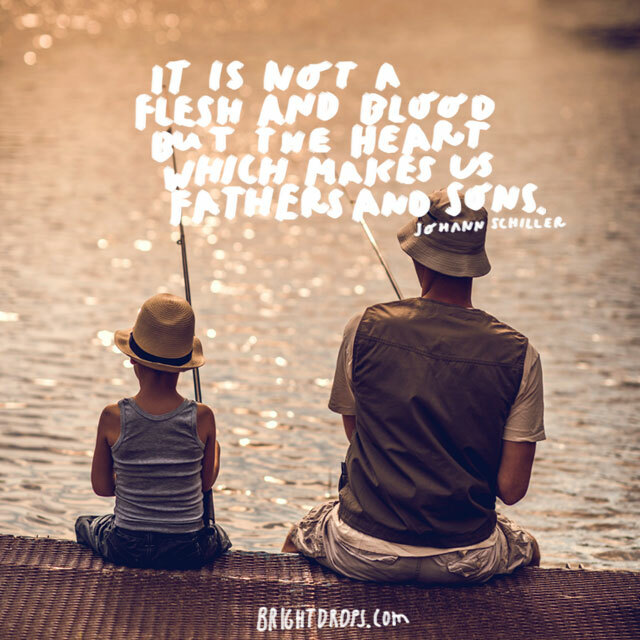 There is a lot of heartache in the world. Be it a divorce, loss of job, accident, or other trauma and tragedy, your family is the place you go to seek refuge and healing. They are there to support you and lift you up when the world has let you down. No matter how famous, infamous, or unknown a family is, they all experience their own troubles, joys, rebellion, and scandals. 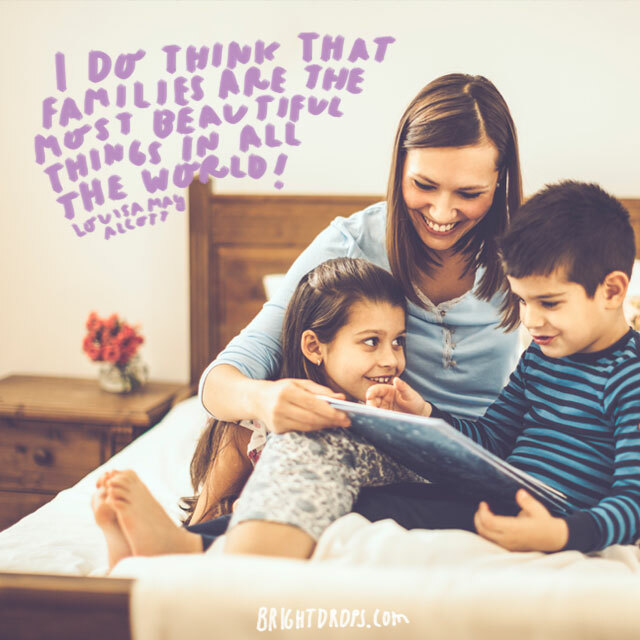 Your family is probably more like all the rest than you would think. So love them and be there for them. They are the only ones you’ve got after all. When life has you down, your family is there to love you. You might go through some intense personal changes where you doubt yourself, but your loved ones can help remind you of the wonderful person you are so that you go back to believing it. 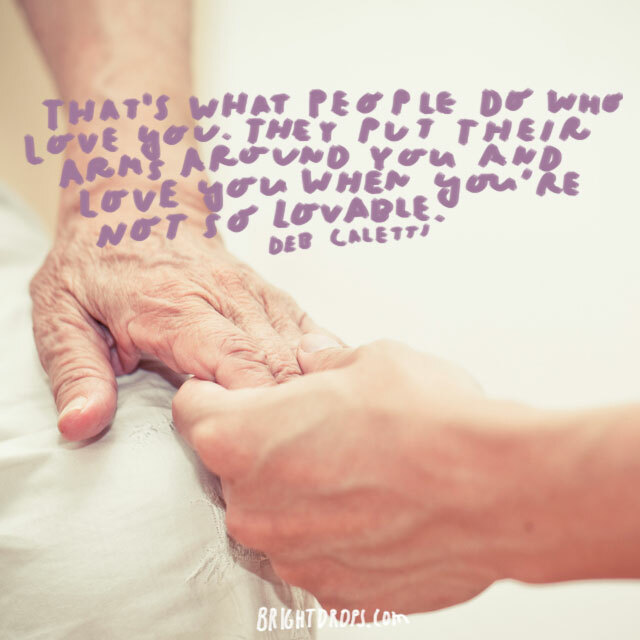 Let them love you and help you. It might not look the greatest, and be a little dysfunctional, but if it tastes good then that is what is important. Your family might be weird, a little crazy, and sometimes annoying but if you have love, laughter, and support, then you have the important things. A loving family will often forgive and forget many things because at the core, they really love each other no matter the shortcomings. 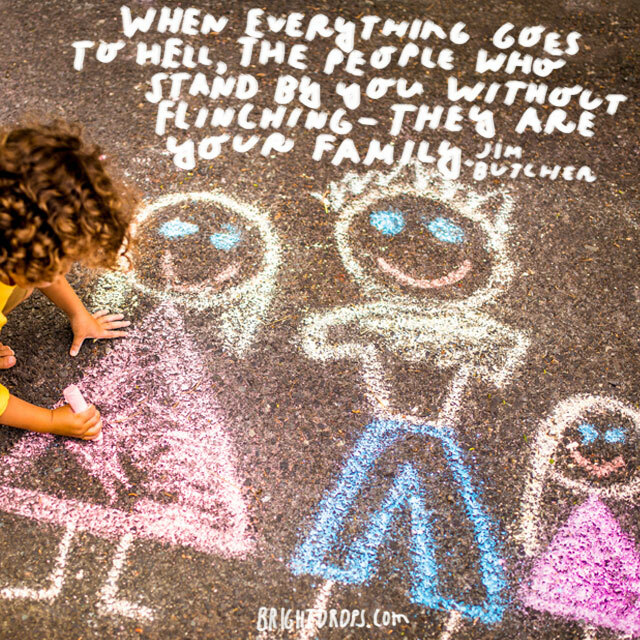 Your family knows you inside and out so even though you might hurt each other from time to time, it is easier to forgive when you all know what makes the others tick. Happy times are truly more memorable when they are experienced with those you call family. Being able to look back on your life and remember the joy you had with your loved ones is a valuable thing indeed. If you look at your life and see where more happiness could exist, then go and create some! 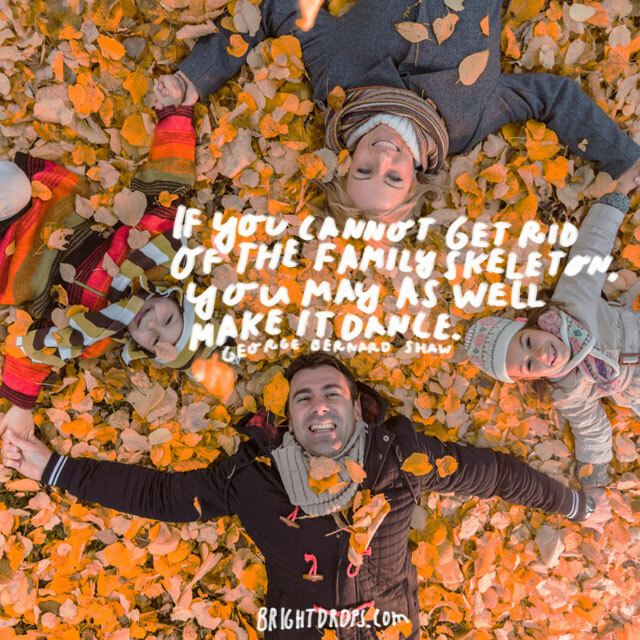 All families have some kind of skeletons in the closet. If they are persistently annoying then the least you can do is take them out and have some fun with them! 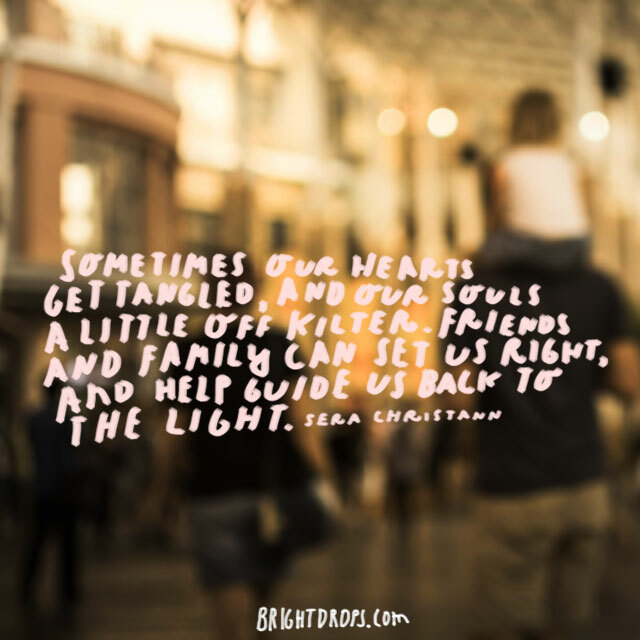 Bring some light onto the troubles that exist in your family to see if you can’t help everyone heal and move on. 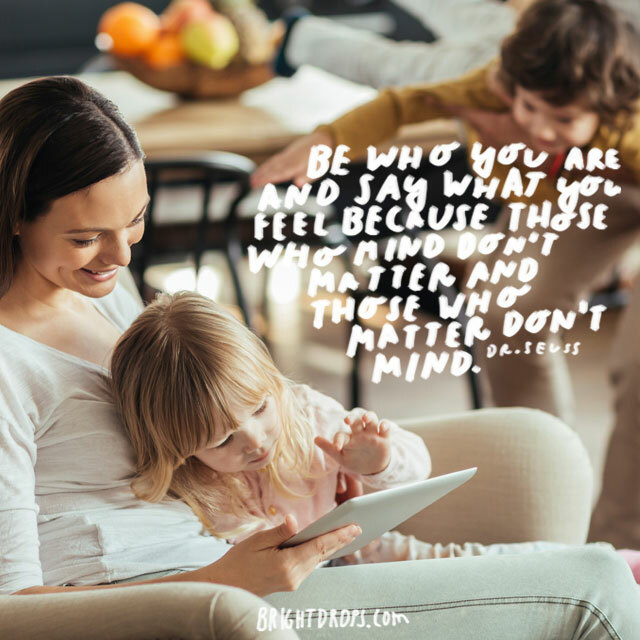 Truly loving families are the ones in your life that matter the most and they most likely don’t mind you being your authentic self. They will celebrate your unique identity and roll with whatever you need to say and do. Much of the world will have a mind about you but they don’t matter like your family does. A loving and nurturing family will forgive easily and provide an atmosphere of acceptance for all within it. 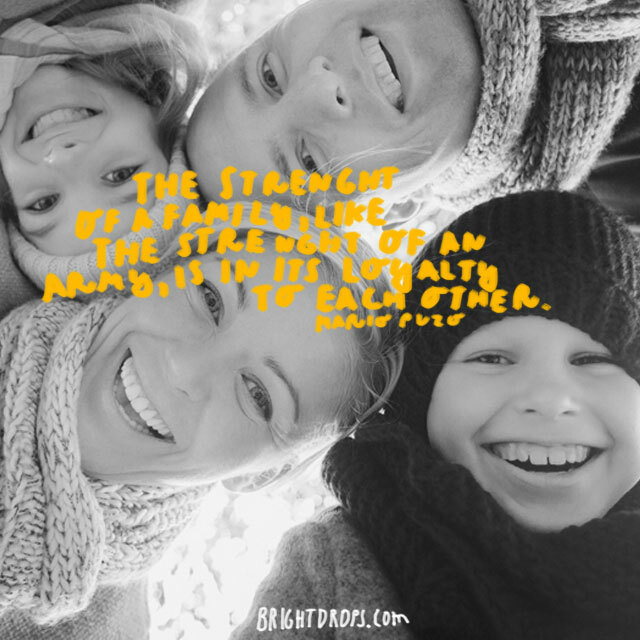 These traits might seem weak to some, but they are the true strength of a loving family unit and will stand the test of time. 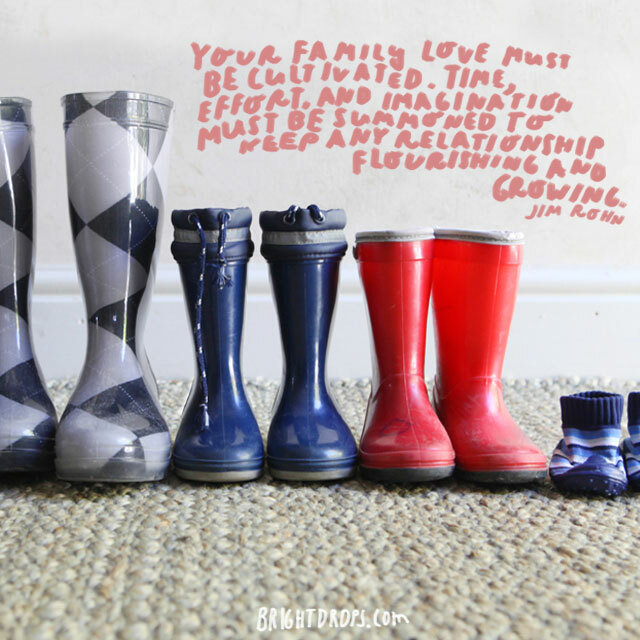 Be flexible and love your family as fluidly as they love you. We do things for our loved ones that we might not particularly like, but doing so means we are in service to them. Being family means being there for them rain or shine and it might not be something you enjoy, but you do it because you love them.